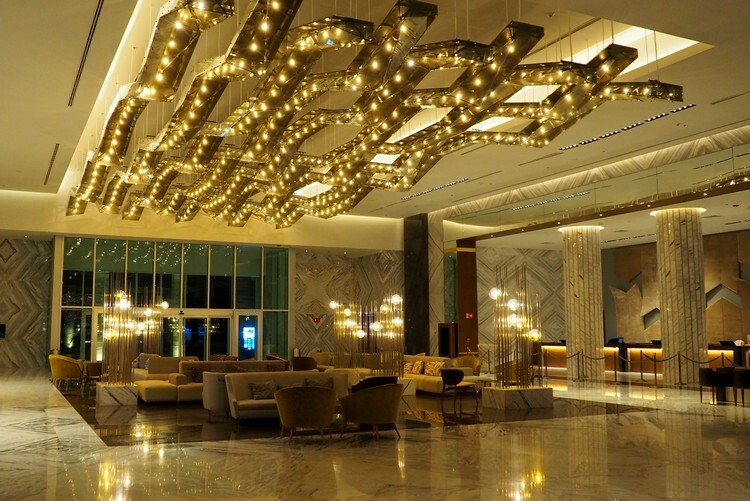 The Grand at Moon Palace is the newest addition to the luxurious Moon Palace Resort in Cancun, Mexico. 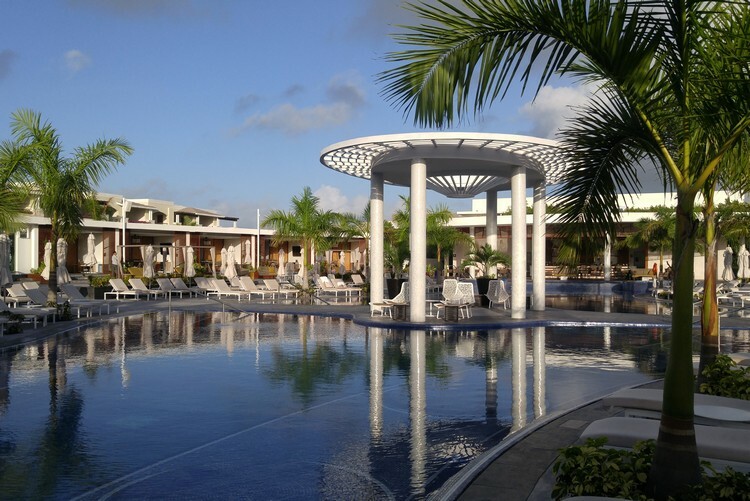 At the time of our visit in February 2018, this all-inclusive resort had been open less than one year. 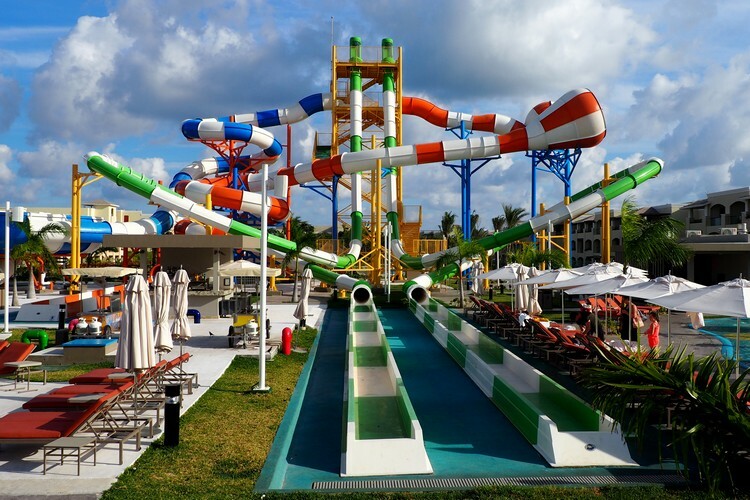 The Grand at Moon Palace is a five-star resort with over 1,300 guest rooms, 9 pools, 16 restaurants, 9 bars, world class spa, indoor bowling alley and an impressive outdoor water park that has a wave pool, lazy river and several mega-slides. And that’s just The Grand property. 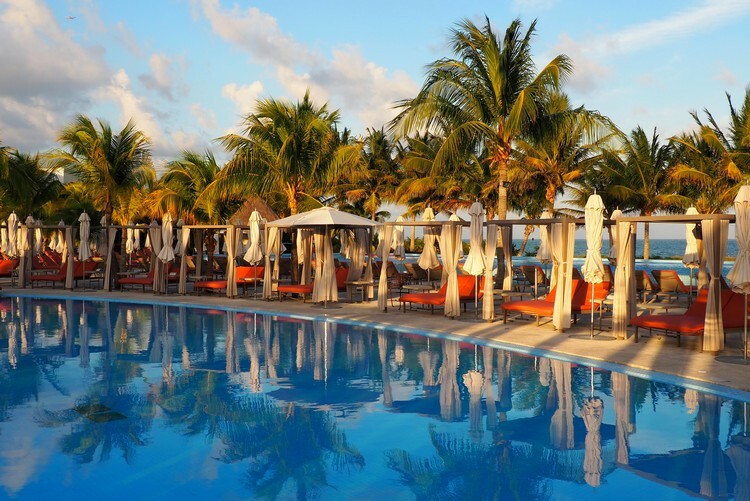 Guests staying at The Grand also have access to the other two resorts on the Moon Palace Cancun property – Sunrise and Nizuc. 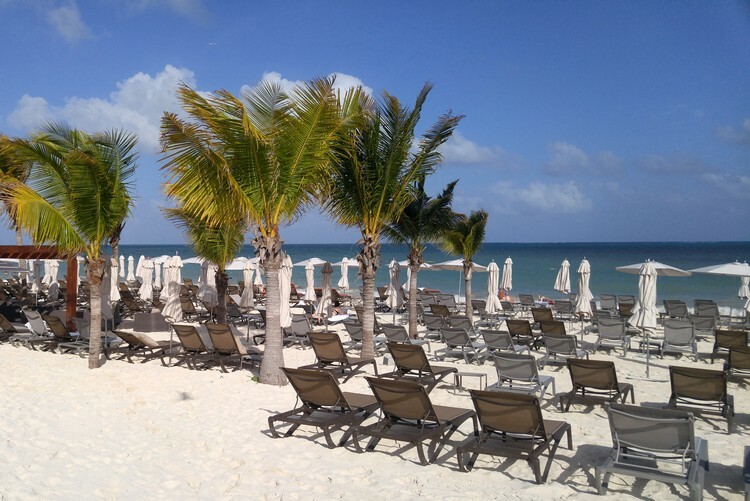 How is the Beach at The Grand at Moon Palace? How are the Pools at the Grand at Moon Palace? 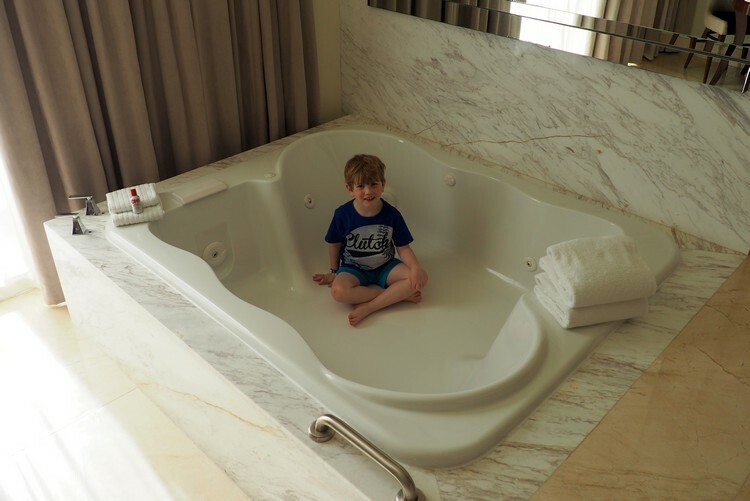 Is the Grand at Moon Palace Family Friendly? Are the water slides open at the Grand Moon Palace? How is the Food at Grand at Moon Palace? 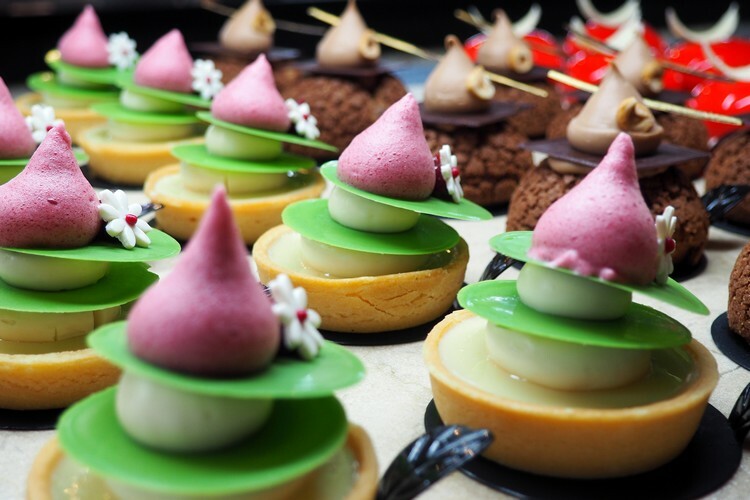 Grand Desserts that are a work of art! 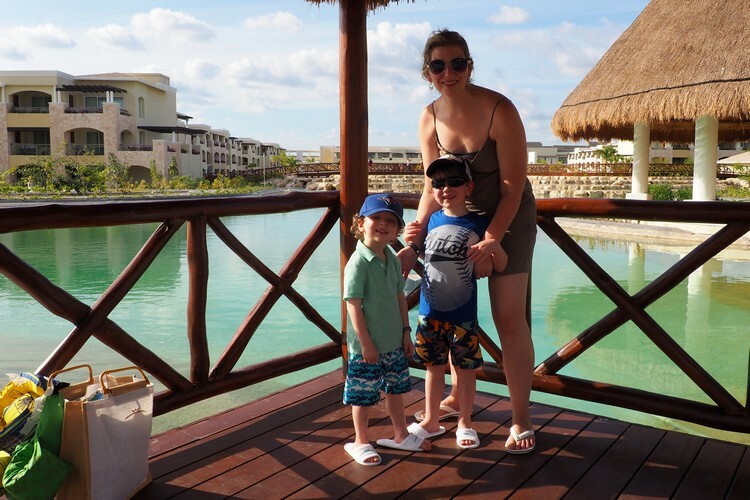 We have visited Cancun and the Riviera Maya several times but this was our first time staying at the Moon Palace. 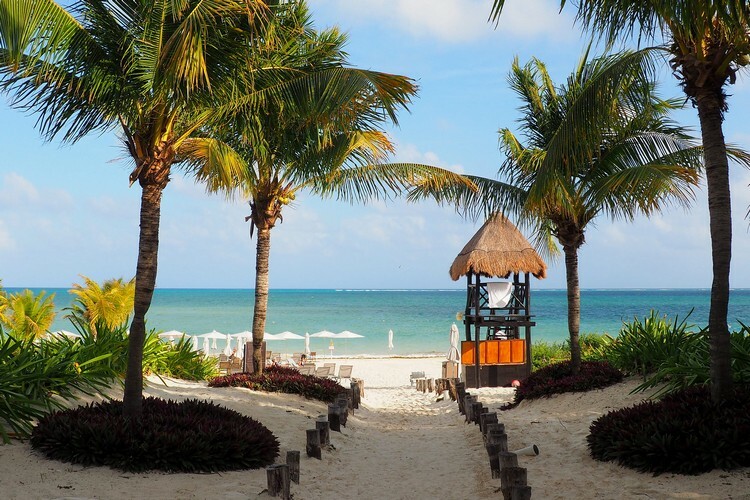 We heard great things about this new luxury resort, so we decided to include a few nights at The Grand after our vow renewal ceremony in the nearby Riviera Maya. Because The Grand is so new, we had a hard time finding information about the resort (besides the company website). 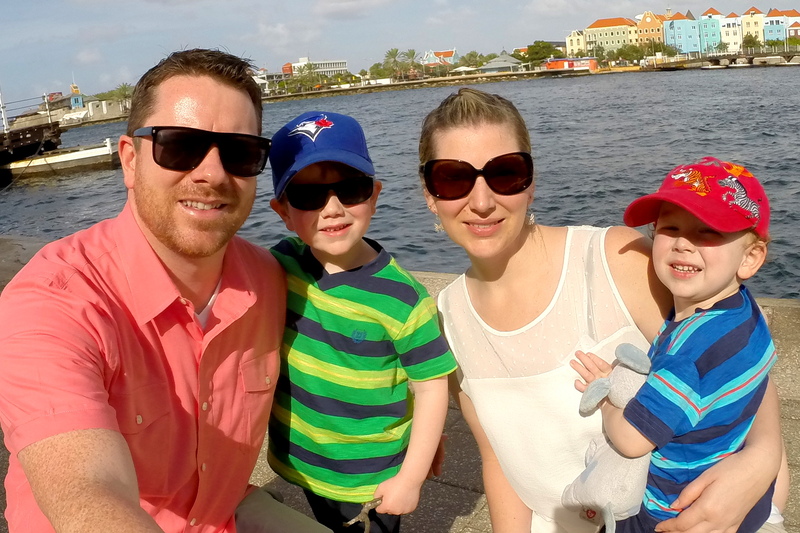 This post is our attempt to answer the questions we had before booking our stay. 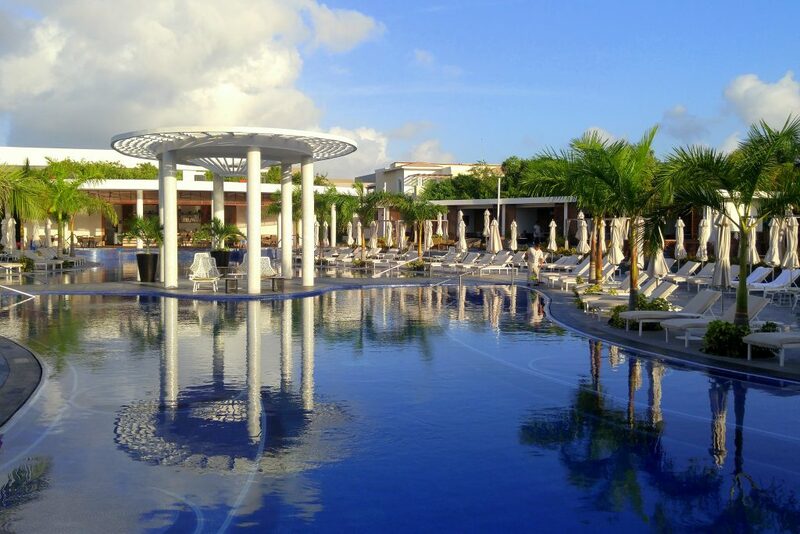 If you have questions about this resort, leave us a comment below and we’ll do our best to answer. The main lobby of the Grand is quite Grand! 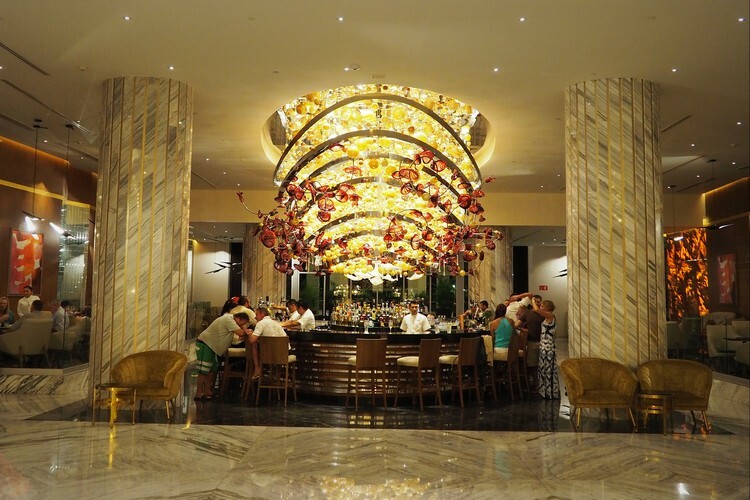 Above – the elegant Lobby Bar chandelier is a work of art. The Grand has a clean, modern décor that feels more like an upscale Las Vegas hotel than a typical Mexican all inclusive. 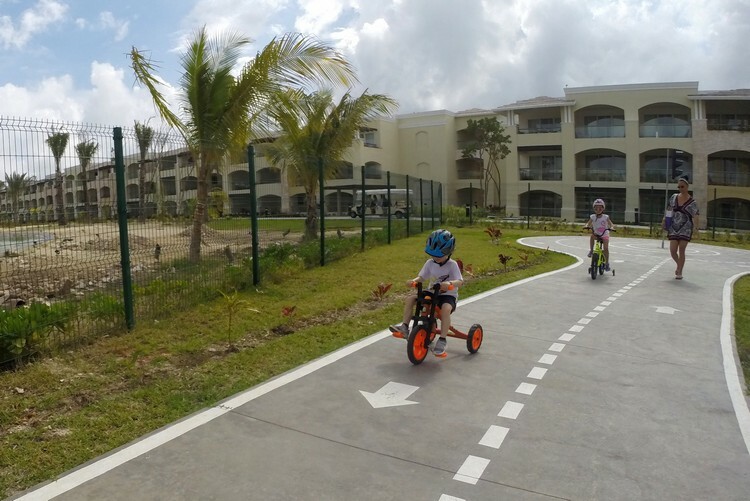 It caters to the luxury family segment that wants an all-inclusive resort that can be enjoyed by both adults and children. 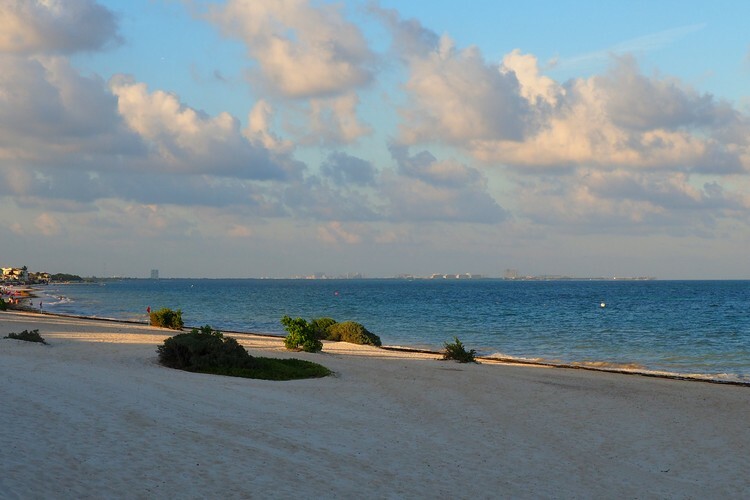 One of the reasons we keep coming back to Cancun and the Riviera Maya is its silky smooth sand. Seriously, it’s some of the nicest sand you will ever sink your toes into. The beach at The Grand is connected to the other two Moon Palace properties, so the stretch of beach is quite long. If you like long walks on the beach, this beach has you covered. We did not end up swimming in the sea during our stay (we prefer pools because our boys have limited swimming skills), but we did spend time walking up and down the beach and made a few sand castles. The beach does not have a reef, so if you want to go snorkeling you’re best to join a tour and head to some of the nearby dive spots. No need to bring your snorkel gear unless you plan to leave the resort. Watch this short video from our time at The Grand. You can see the Cancun hotel zone in the horizon. 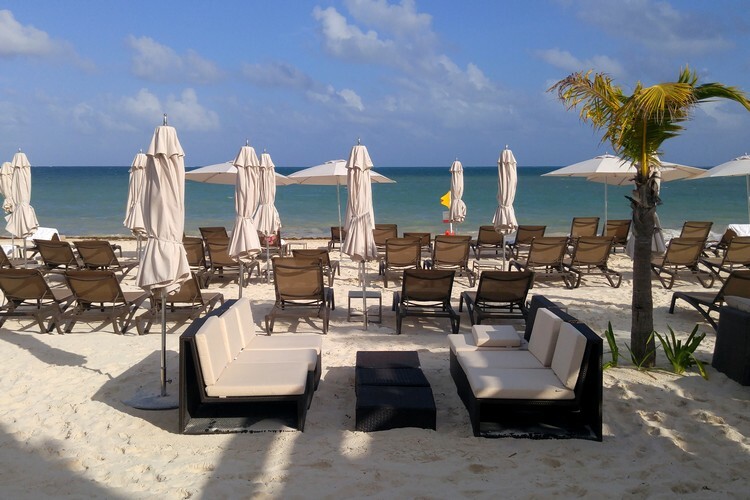 There are plenty of chairs, umbrellas, couches and loungers at the beach. Get a $45 credit for AirBnB accommodations here. 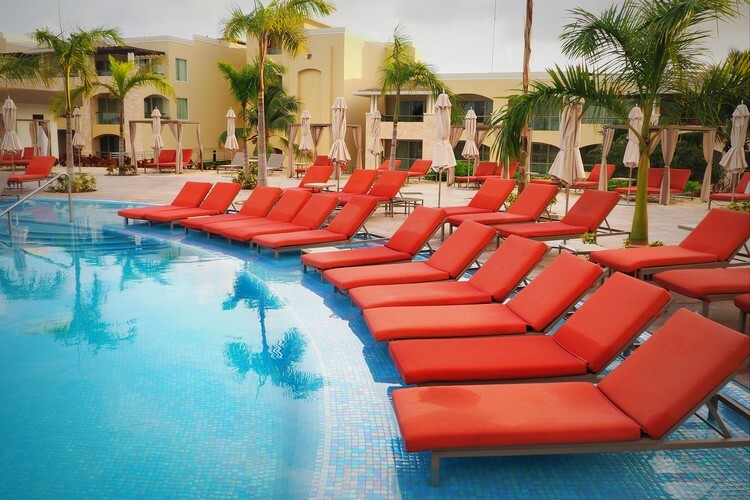 There are 9 pools at The Grand, so you will not have any trouble finding available loungers by the pool. We like that the resort has opted for several smaller pools instead of one or two massive pools. It spreads people around the property instead of having everyone congregate to the same area. 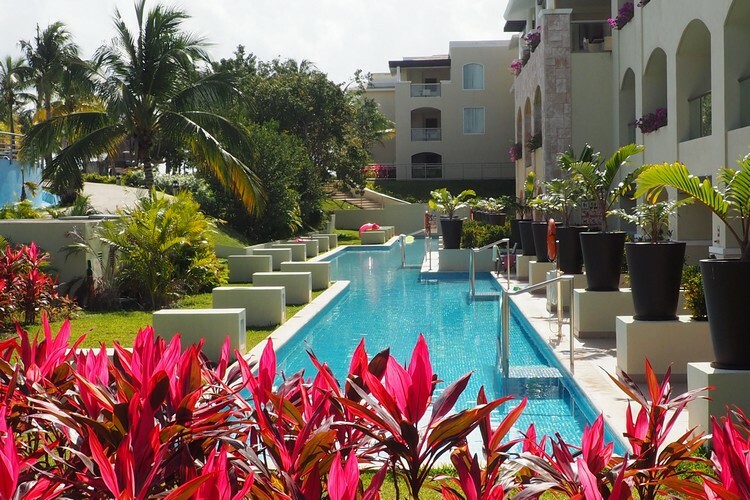 We found that each pool offers a different vibe, so your bound to find one that works for you. 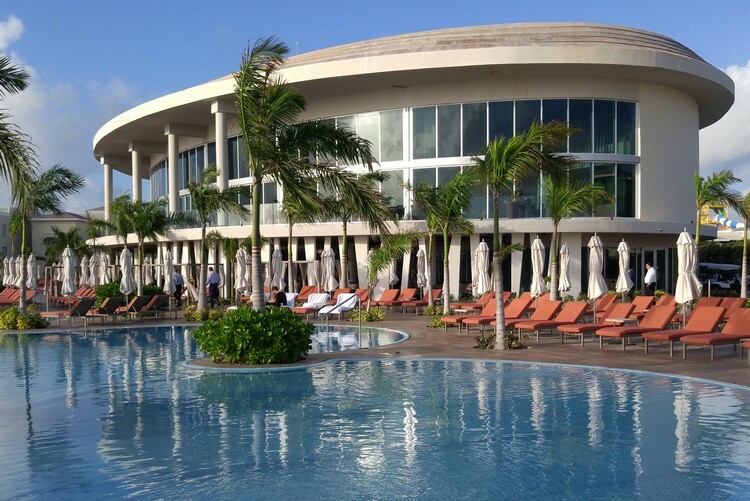 Guests at The Grand also have access to the pools and facilities at the Sunrise and Nizuc. We spent most of our time at this pool, which is located near the beach. Do you follow us on Instagram? If not, let’s connect! 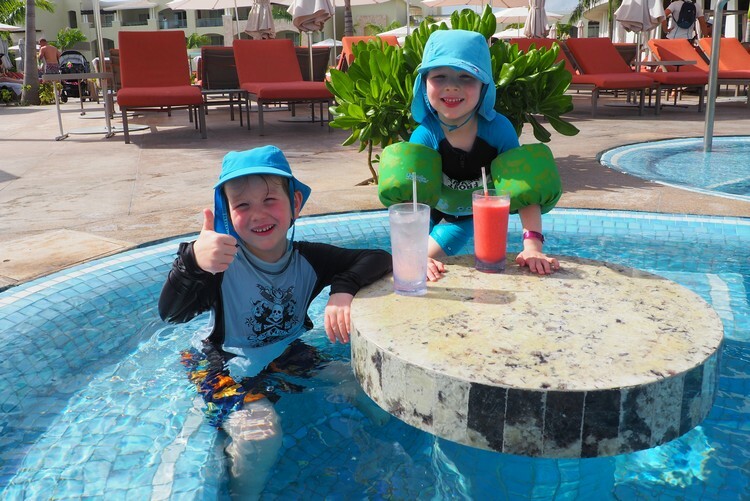 Being able to have cold drinks in the pool was a big hit with our boys. They loved these seats. Can you spot Nicole an the boys? We spent time at most of the pools and each time we never had trouble finding seats. This is the adult only pool at the Grand at Moon Palace. Whirlpool at the adults only pool. We didn’t spend any time at this adult pool (because we were their with our boys), but it looks like a super relaxing place to spend the day(s). You can also hang out in style in these comfortable private rooms with televisions and sofas (see photo below). These private rooms would be great if you visit the resort with a group of friends. I’m not sure if there’s an additional charge for these rooms. 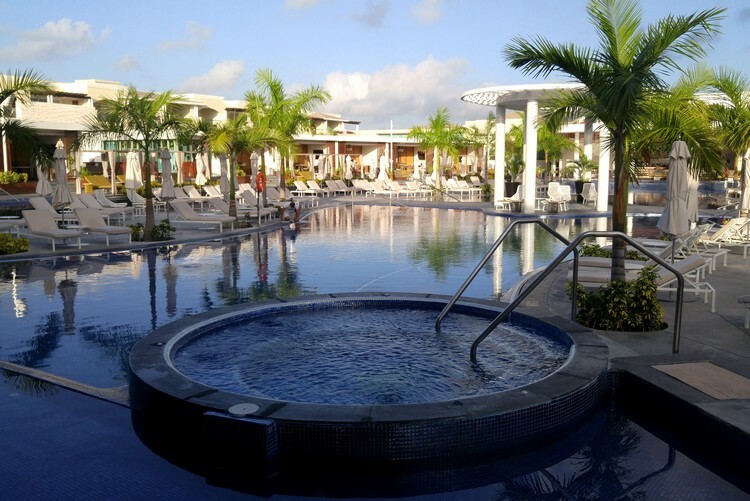 Follow #ThePalaceLife to see more awesome photos from guests staying at Palace Resorts. This is the Diamond Elite Pool. Every pool is full service and there’s always a bar nearby. How cool is this poolside table? Towels are complimentary and each pool has a towel hut. The best part is that you don’t need to keep track of your towels. There are no annoying towel cards required. You just take as many towels as you need. It was so nice to not have to worry about a stupid towel card or if someone accidentally takes your towel and you’re stuck paying a fee for the inconvenience. All beach resorts should follow this example! Some of the hotel rooms have a pool directly in front of the patio. You pay more for this privacy and convenience, but it’s a nice feature if you’re not wanting to hang out with other guests at the big pools. Yes! 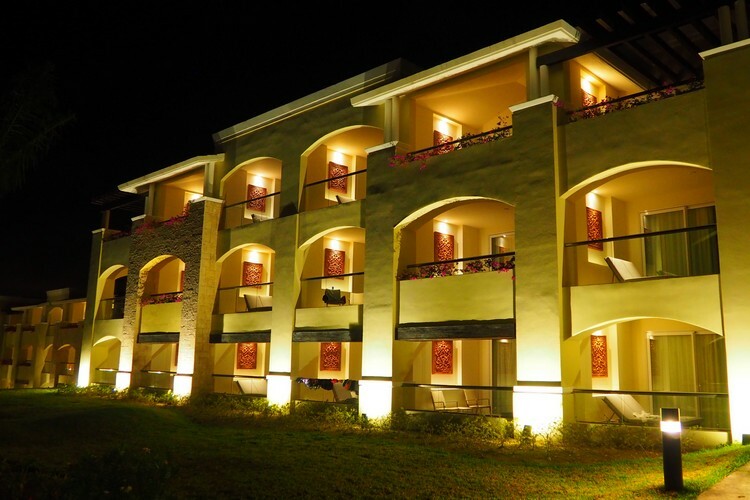 We can say with complete confidence that traveling families will enjoy their time at this Palace Resorts property. 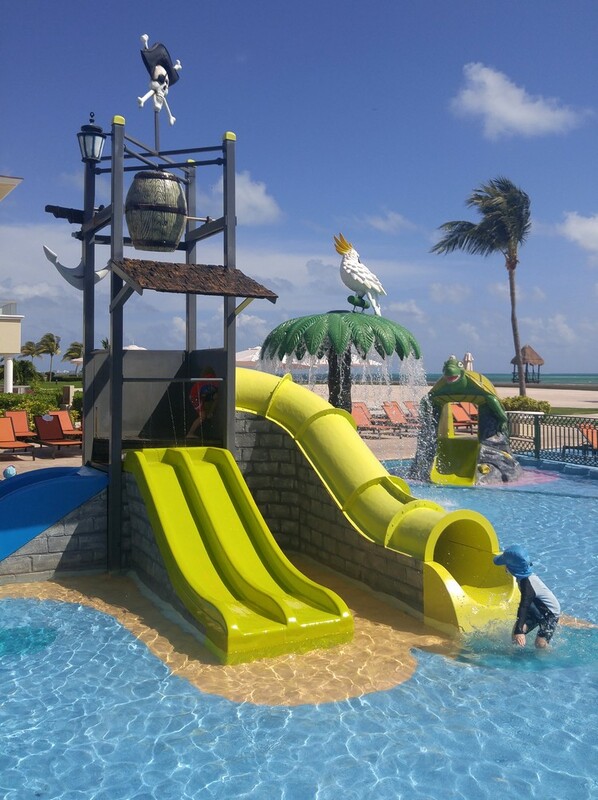 When we book all-inclusive vacations we want to make sure the resort is family friendly. This goes beyond having a kids pool and chicken nuggets at the buffet. 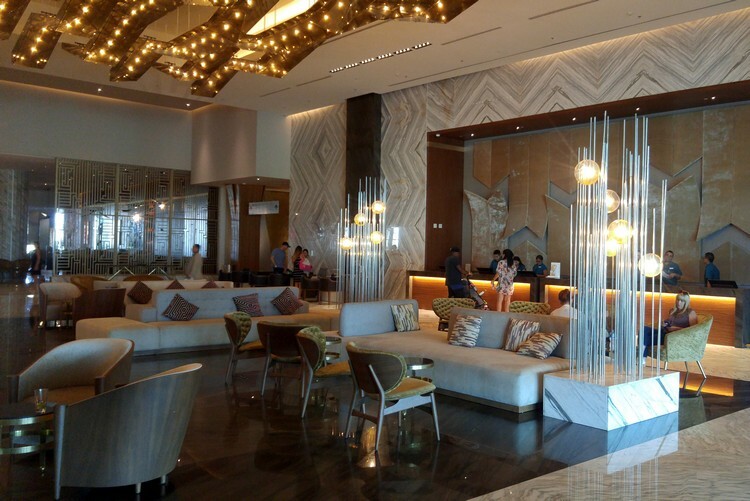 While The Grand is an upscale luxury resort, it is very welcoming to families. 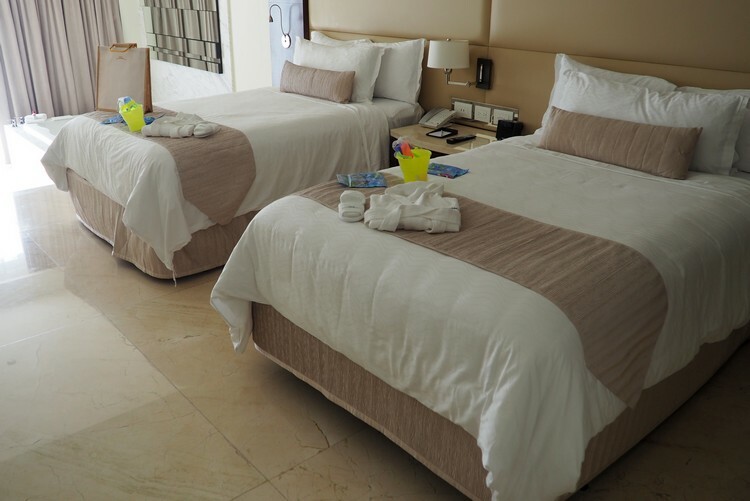 When we entered our room, we received gifts on the beds that included a beach pail and shovel, water wings and a nice beach bag. Our boys were also given kid-sized house coats and matching slippers. The shower in our room even had kids shampoo. Those little details matter, and they are much appreciated. The water park at The Grand is amazing! 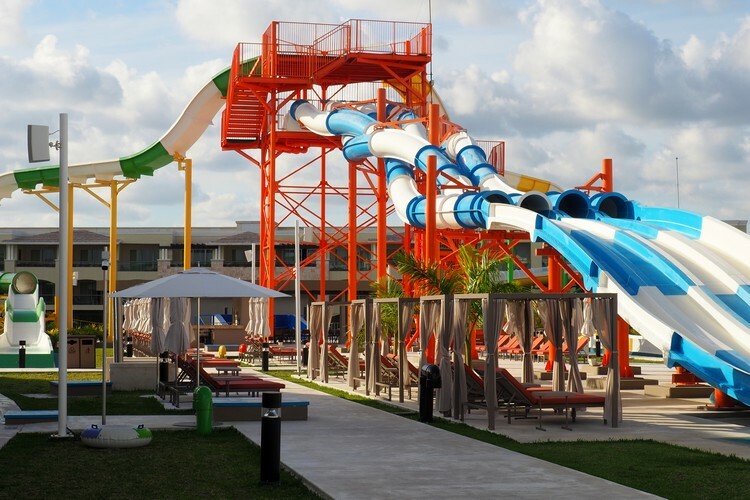 As you can see from the photo above, this is MUCH more than a few kiddie slides and splash pool. It’s a full on Water Park! 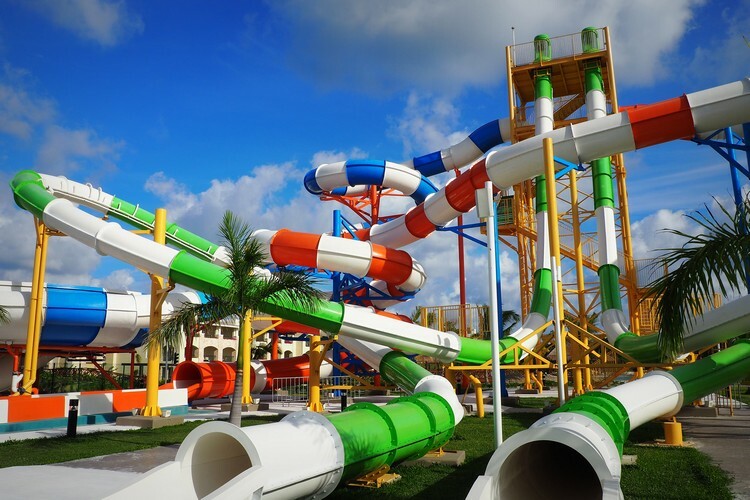 This water park has several large spiraling water slides, a wave pool, lazy river and a kids play zone that includes glow-in-the-dark mini golf, unlimited video games (for FREE), a climbing ropes course, bumper cars, 3 level jungle gym and a toddler area. Wave pool at the Water Park. Learning to float in the wave pool. The resort provided free water wings – nice touch! Floating down the Lazy River at the Water Park. Connor enjoyed floating down the lazy river with his Mama. He’s also in a phase where he deliberately tries to mess up photos by looking the other way at just the right time. This was the only decent photo of him after 10+ attempts on the lazy river. Little bugger! One of the questions that kept popping up when we were researching The Grand at Moon Palace was if the Water Park was open. As we mentioned at the beginning of this post, The Grand is brand new. The Water Park has taken a little longer to get fully operational but it’s mostly ready – except for the giant water slides. 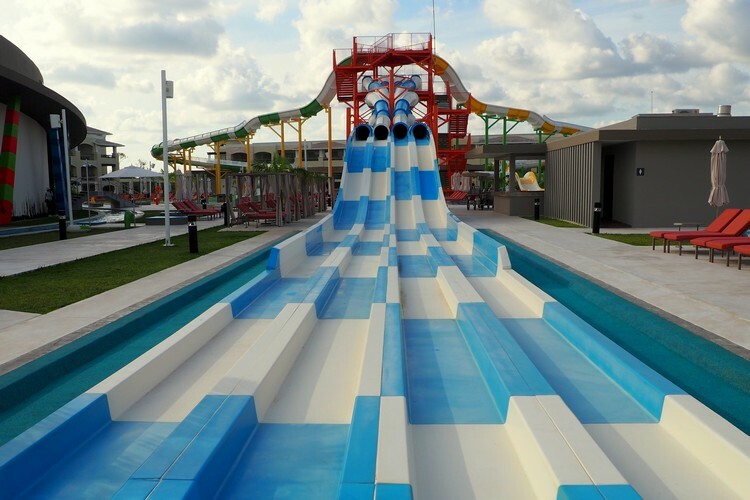 We were told that the expected opening date for the water slides is end of April 2018. 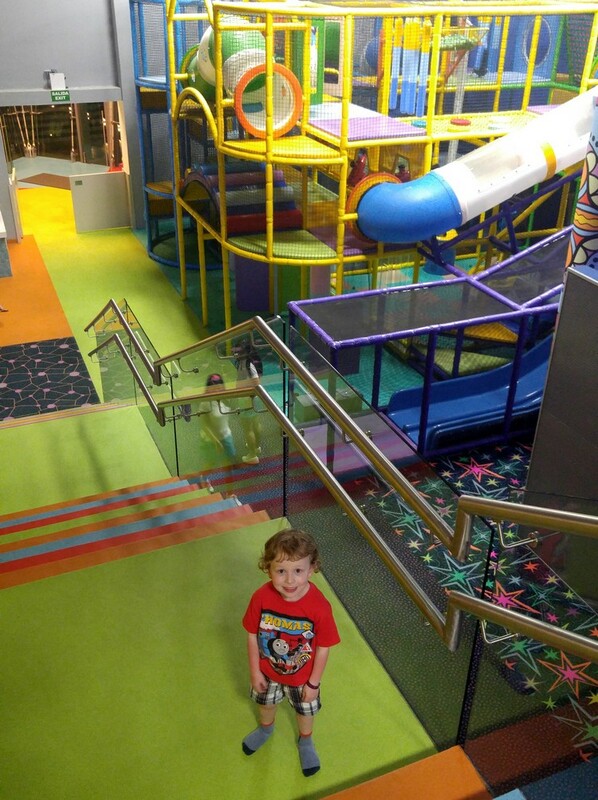 The kids play area has 4 slides that are already open, so your little ones will be happy. For the big kids, it’s going to be a few more weeks before the slides will be ready. In the meantime, the lazy river, wave pool and games room will keep the entire family entertained. These slides are going to be so much fun when they are open. 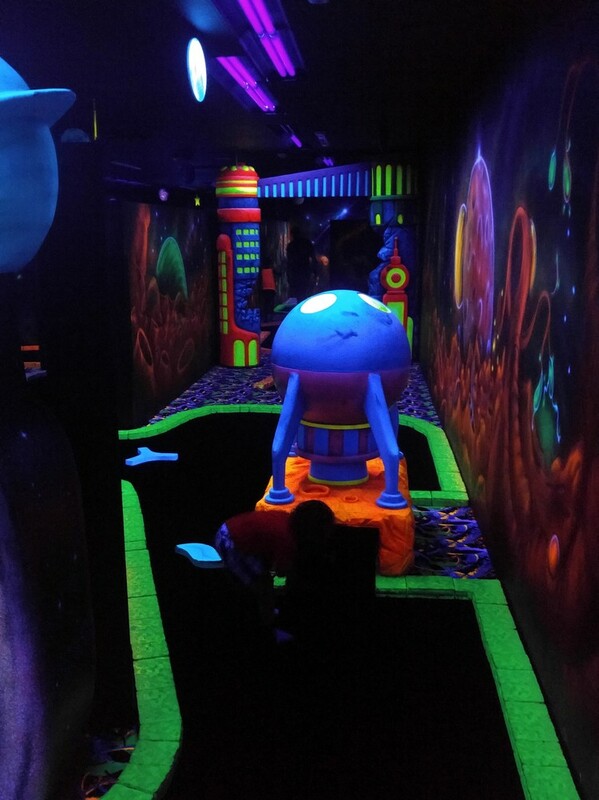 The Kid’s Playroom has a fun glow-in-the-dark mini golf course. 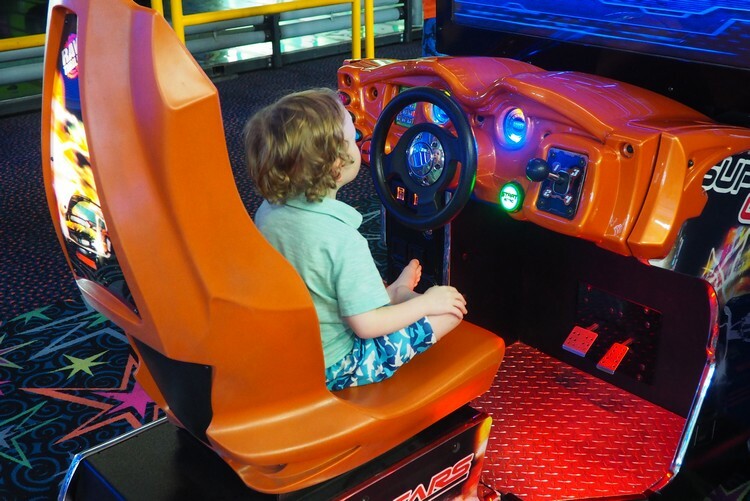 We love that all of the arcade games and activities are FREE at the Grand. We literally spent hours in the Kid’s Playroom every day. Our boys didn’t want to leave and, when we did leave, they kept talking about when we would return. These photos did not turn out well because of the low light but you get the idea. 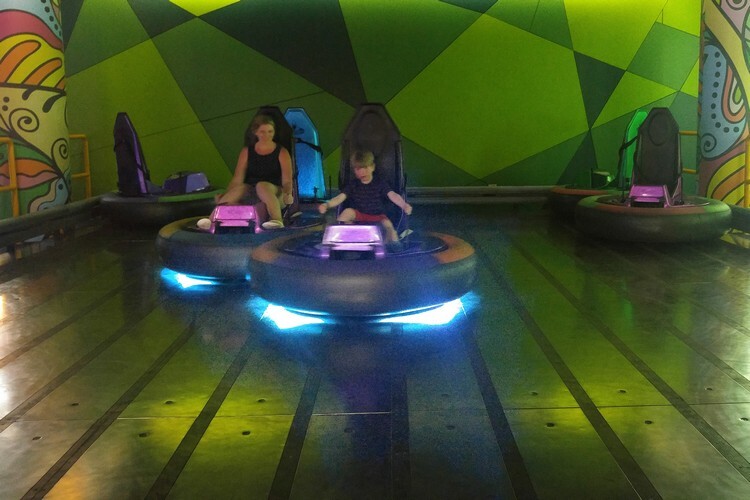 Bumper Cars are always a good idea. Even better when you have unlimited turns! This 3-level jungle gym was such a big hit with our boys. 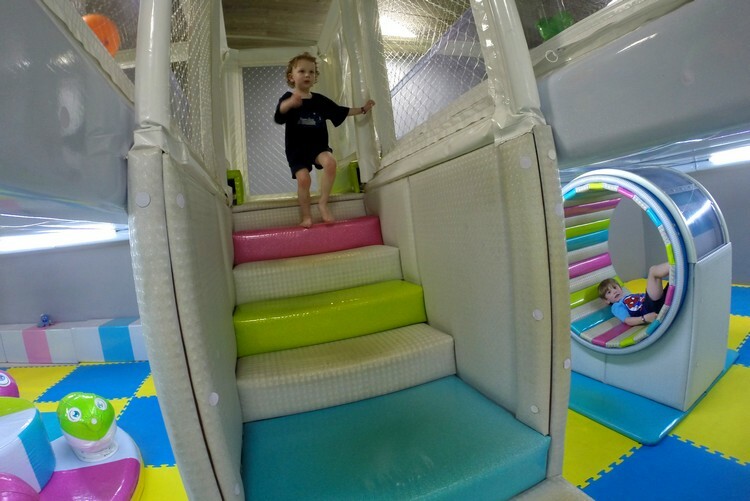 We have a similar indoor jungle gym near our home in Vancouver, but this one is way better. It’s also brand new. Our youngest boy, Connor, absolutely LOVED this place. It’s a kid’s paradise! “Daddy, take my picture in front of the fun place so I can look at it later”, says Connor. So cute. 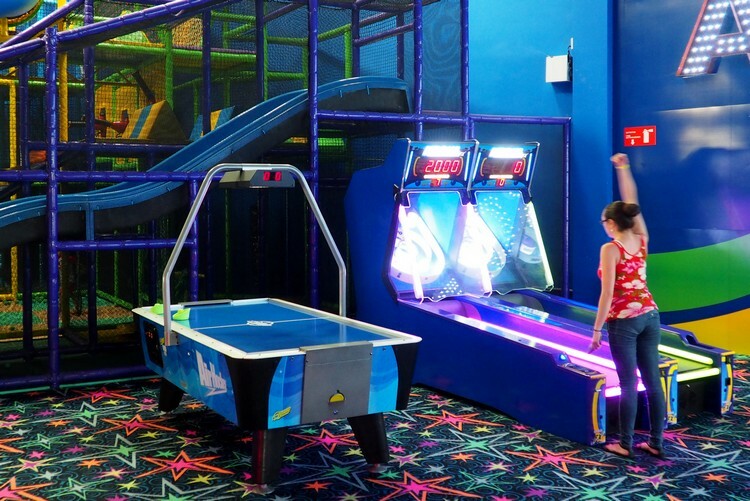 There are two different games rooms that offer various activities. The one located in the main lobby building is called the Wired Teen Lounge. The other one is called the Playroom. 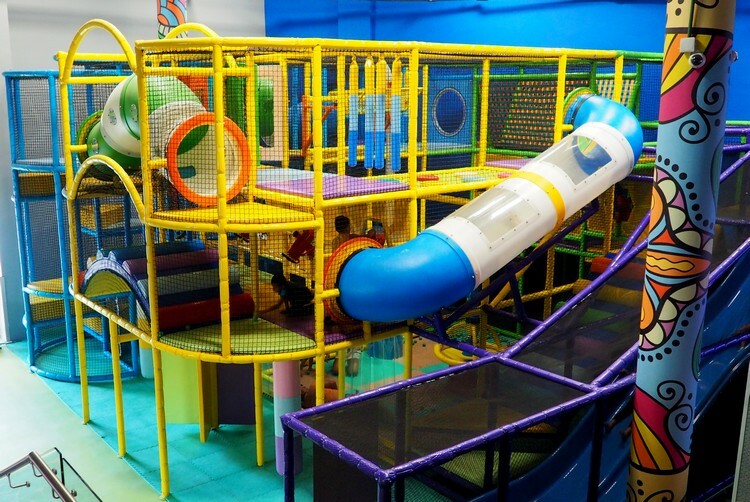 This is the mega-playroom that is located at the Water Park. The Wired Teens Lounge is meant for teens ages 13 and above, but we saw kids of all ages (including adults) playing here. 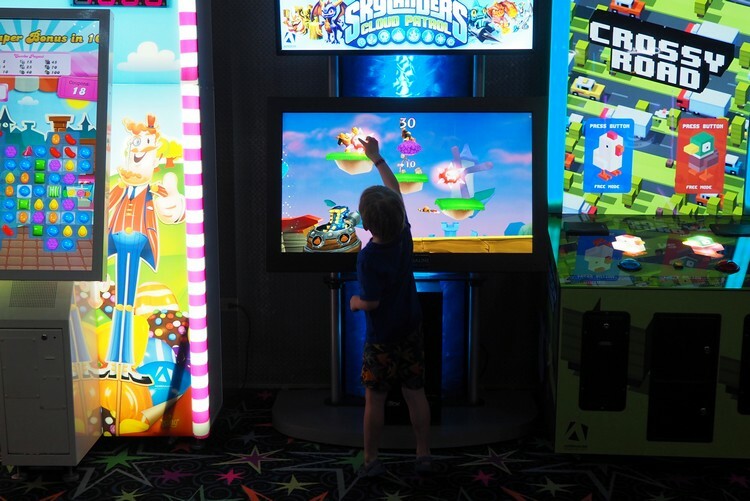 The lounge offers arcade and console video games, carnival games, Internet access, TVs, and a menu of tasty treats, including like ice cream and cupcakes. 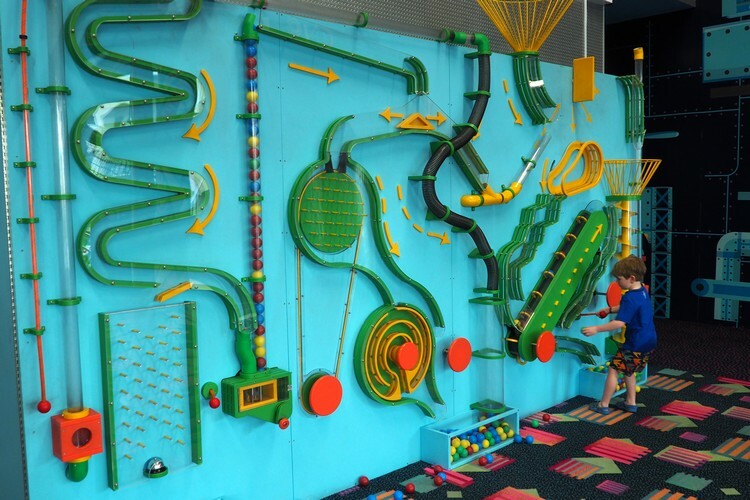 The Playroom is where you will find the jungle gym (pictured above), bumper cars and mini-golf. 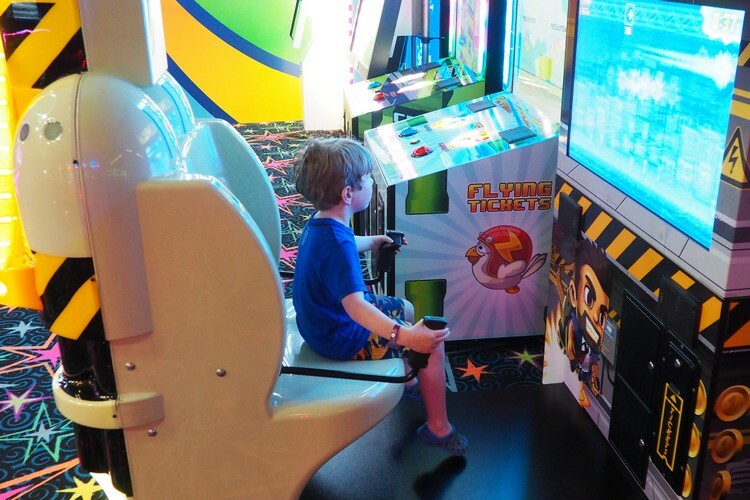 You will find a variety of arcade games of varying difficulty – our 4 year old found games he could play. The best part – EVERYTHING is included! FREE unlimited games all day long. 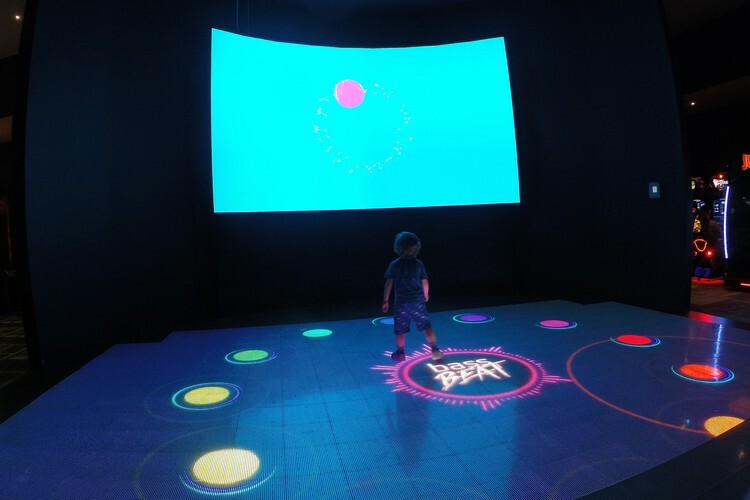 The interactive games are very cool. See photo above as evidence. Connor is playing a game by running around matching colours. This is one of many games that get kids moving. Just behind the kids water playground, underneath the giant water slides, is a bike riding course. Bikes and scooters of all sizes are available to use at no extra charge. Helmets are also provided. 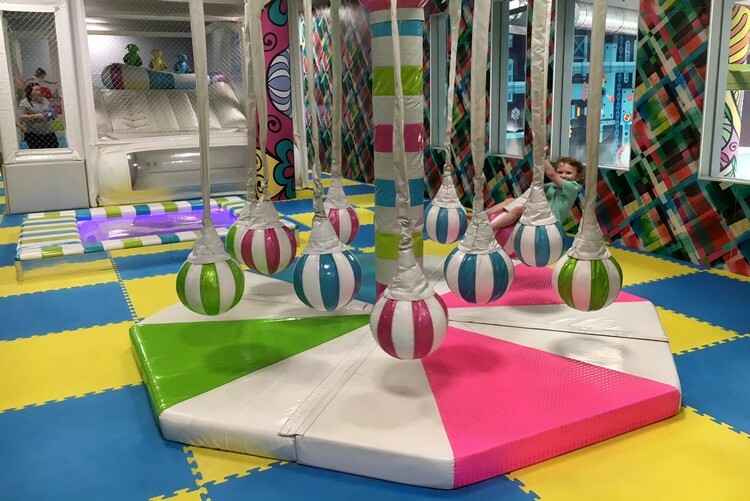 On the second floor of the Playroom is a Kids Club where younger kids can be left so the parents can have some free time. Parents can also stay and let their younger ones play. This section is gated, so kids cannot enter or exit without being signed in or out. Our boys had a lot of fun in here, especially Connor. 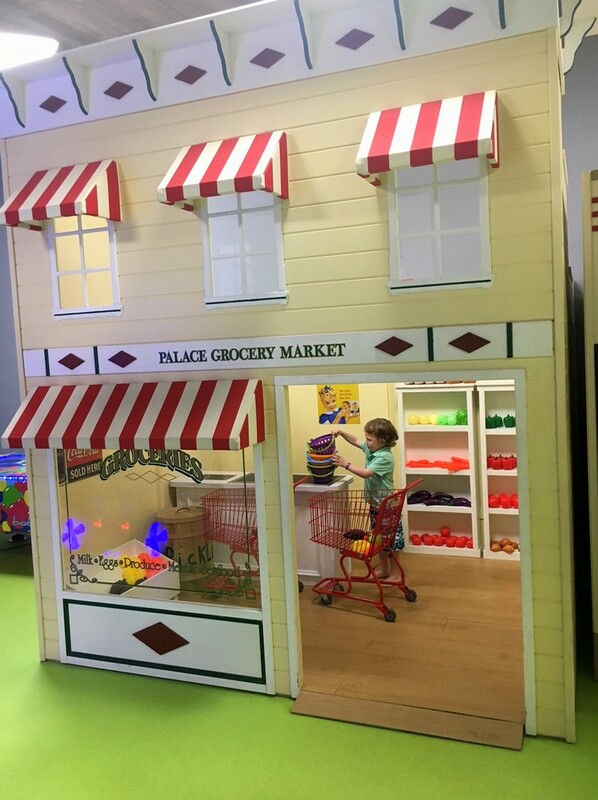 It has a little village where kids can play in small houses, there are bouncy castle structures, and a room filled with balloons. It’s a really neat space for toddlers and younger kids. See more photos from our time at The Grand here. Yes, you read that correctly. 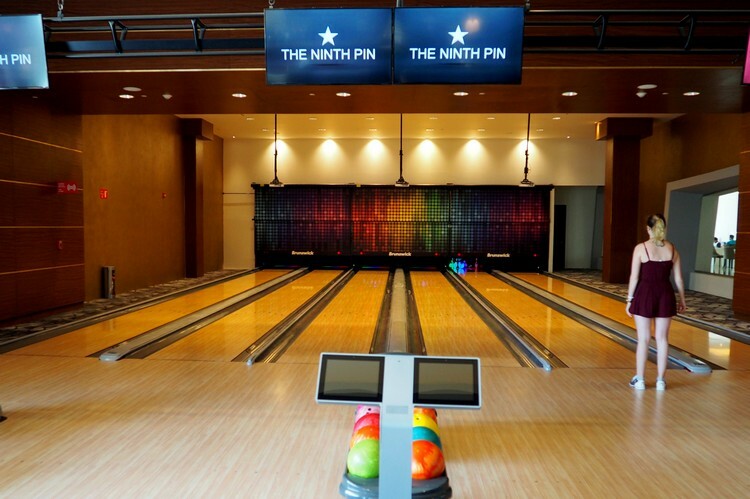 The Grand has an indoor bowling alley on the property – The Ninth Pin Alley. It’s located in the main lobby building. 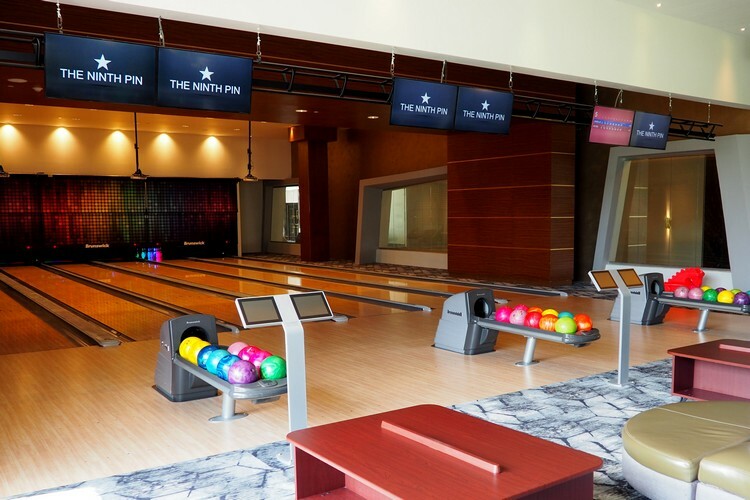 You can order drinks and food while you enjoy a few rounds of bowling. It’s open from 10:00 am to 10:00 pm. 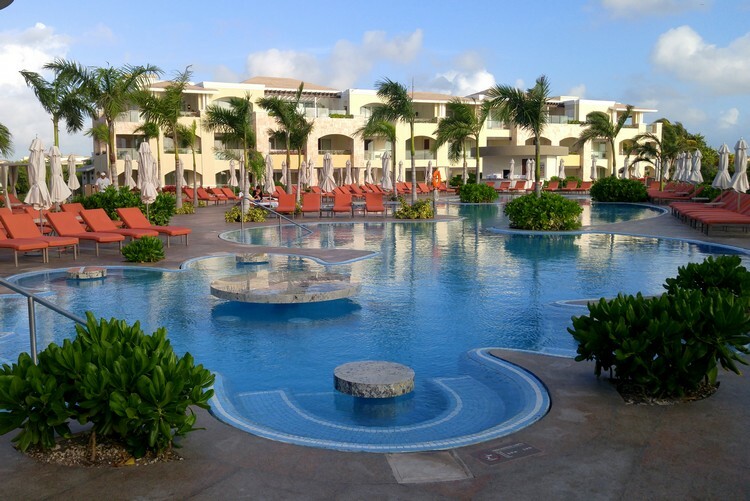 This is one of the only areas we found that is not all-inclusive, so if you wish to play a round or two, you will need to use your resort credits or charge to your room. Most vacationers choose the all-inclusive option because alcoholic drinks are included – it’s one of the reasons why we like them! The quality of the adult beverages at The Grand stood out from past all-inclusive experiences we’ve expereinced. If you’re in the main lobby building or restaurants, beers are served in a tall frosty glass, which is not the typical warm plastic cups commonly found at all-inclusive beach resorts. Even at the pools, the beers are served in tall non-breakable glasses. 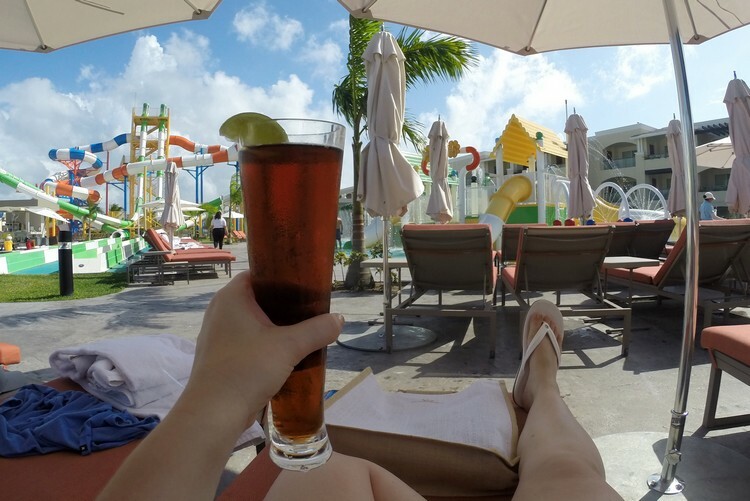 The resort also offers a dark beer option (I believe it was Dos Equis Amber), which we prefer over the watery lagers that most all-inclusive resorts serve. The restaurants offer a variety of wines from around the world. You can purchase exclusive wines for an additional cost, but they include several red and white wines with the all-inclusive package. The food at The Grand was a pleasant surprise. We were very impressed by the quality and options. Only a couple of the restaurants required reservations. We just walked up to the restaurants and were seated instantly. Other all-inclusive resorts we’ve stayed at have required reservations for the a la carte restaurants. It can be annoying because plans may change during your visit, so you may have to cancel your reservation or go to the restaurant when you are not actually hungry. We like that we didn’t have to make formal plans on this vacation. 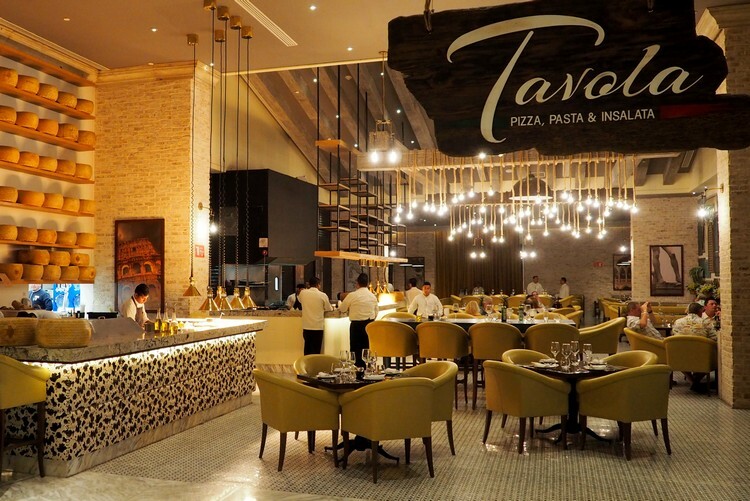 We did not have any issues getting a table, but, if there is a wait, you can hang out at the Tapas restaurant and enjoy a drink and appetizers while you wait for your table. 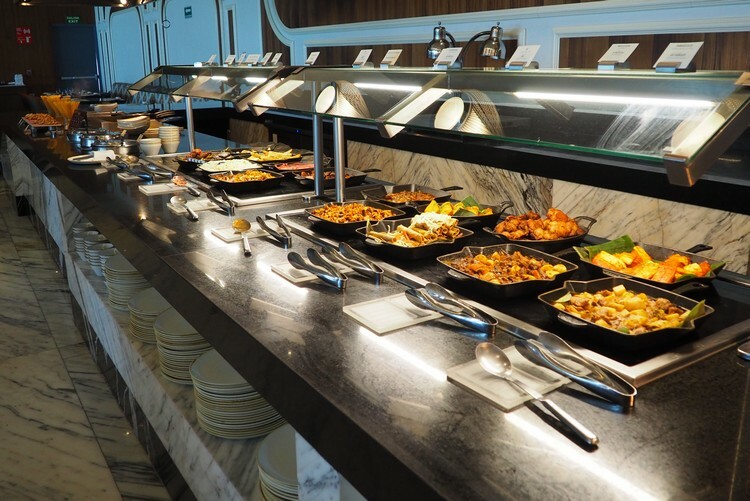 There are 9 restaurants to choose from – NOT including the buffets. Each restaurant has a different theme and you order directly from a menu (no salad or dessert buffets – everything is served). The best part – you can order whatever you want! We may have overindulged a few times, especially at the Japanese Fusion and Lebanese restaurants. 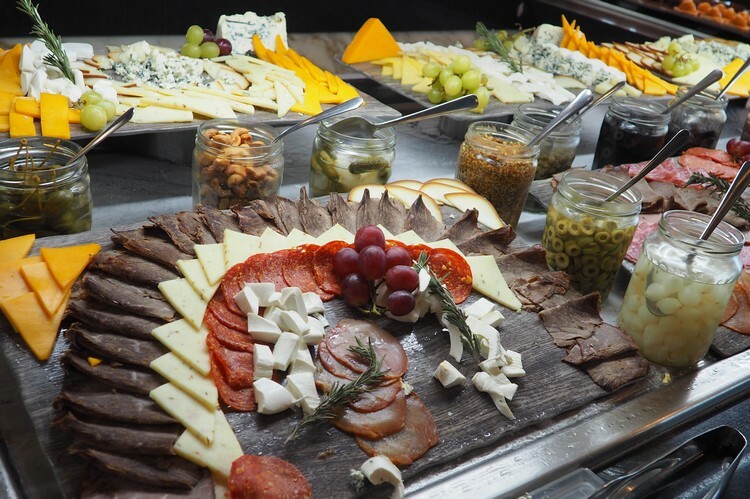 The extensive list of appetizers made it far too hard to choose – so we ordered everything! It was nice that we didn’t have to make any tough decisions. Each restaurant has a kids menu that includs the standard options like chicken nuggets, pizza, hamburgers and french fries. Or you could order from the main menu. Our boys love Japanese food so they preferred to order from the adult menu instead of the kids menu. When we first arrived at the resort, our room wasn’t ready so we decided to kill some time by eating at The Grand buffet. We were very impressed by the spread. 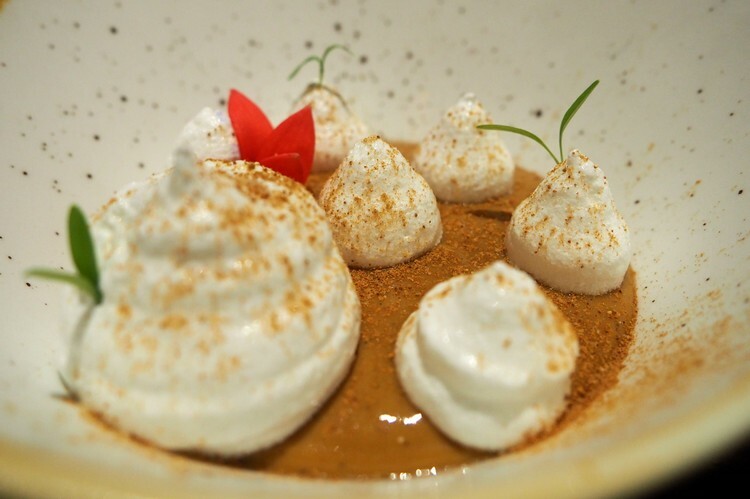 There are so many options to choose from, including salads, seafood, sushi, Mexican dishes and a wide selection of decadent desserts. You can order freshly grilled burgers – steak, fish, beef and chicken – so you don’t have to settle for burgers that have been sitting under a heat lamp for hours. 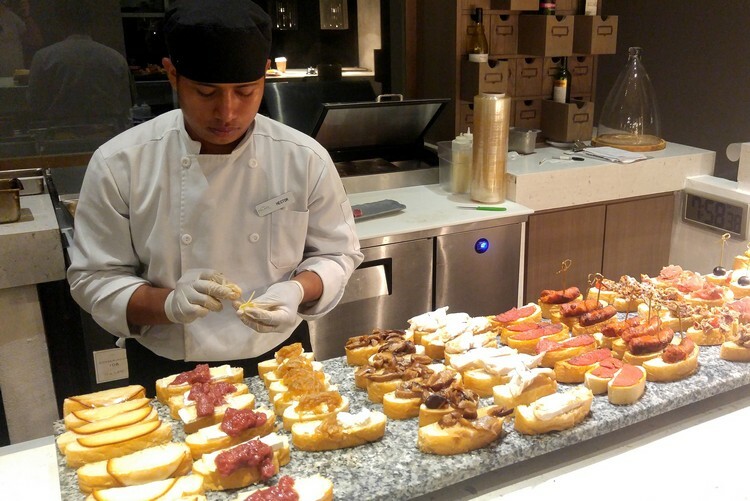 The pasta bar and tepanyaki bar are also ‘made to order’ by a chef. The food is fresh and high quality. 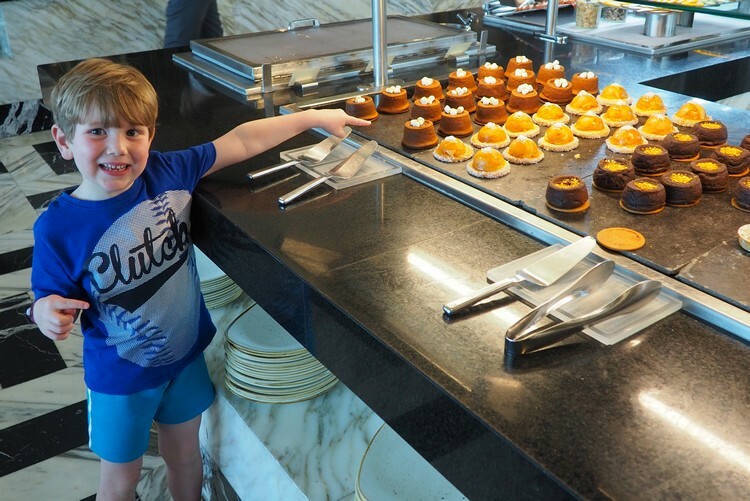 There is also a separate kids buffet that was lower to the ground, so kids are able to easily pick their own food. They thought was really cool. 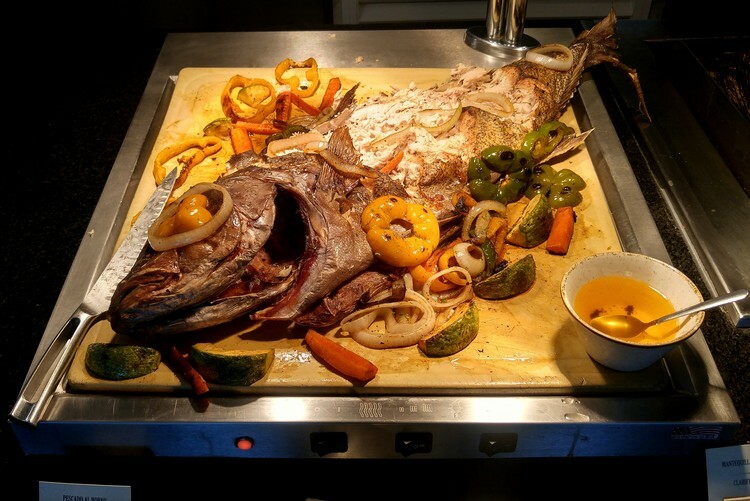 Fresh fish at the main buffet in the Lobby building. 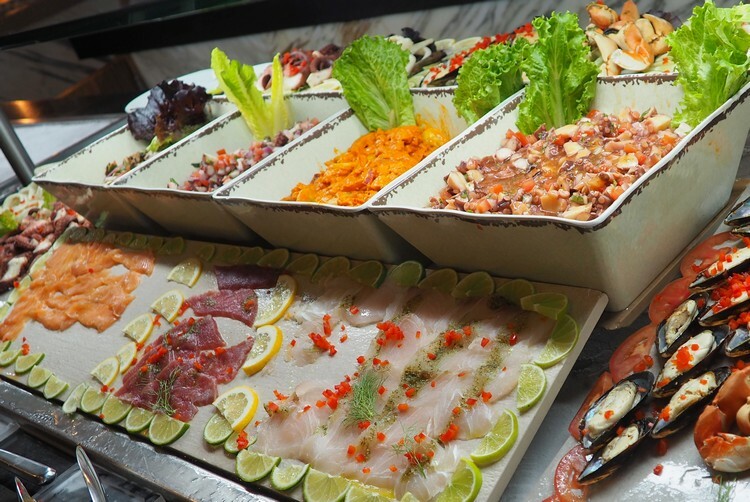 Fresh seafood selection at the Grand buffet, located in the Lobby building. That’s a lot of squid! Yum. I may have come back to this plate a few times. The quality of the seafood was very good. 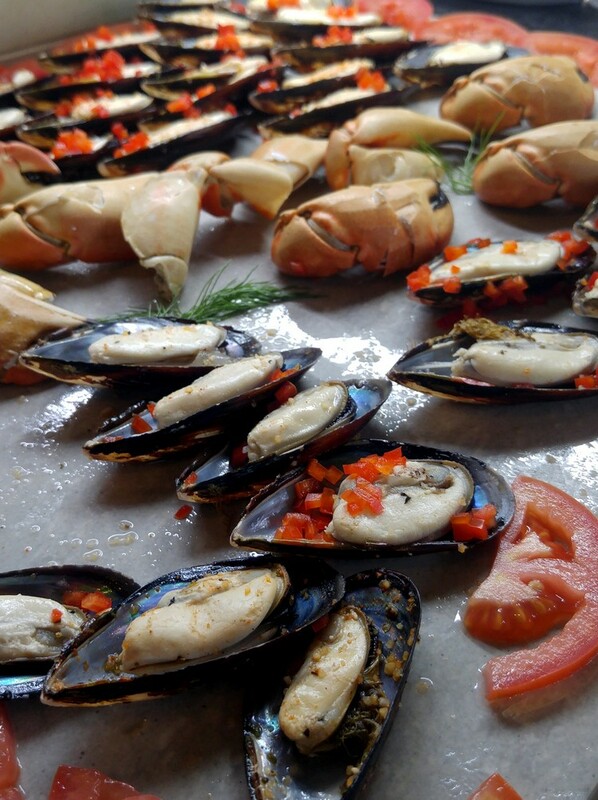 We enjoyed these mussels and fresh crab. 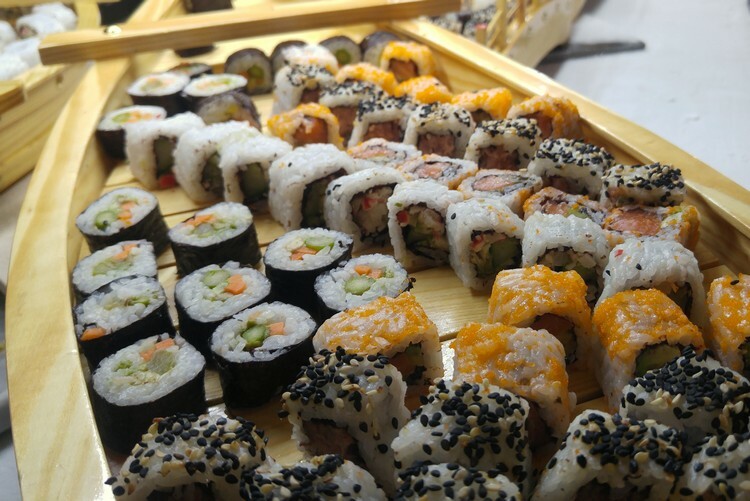 Variety of sushi rolls at the lunch buffet. 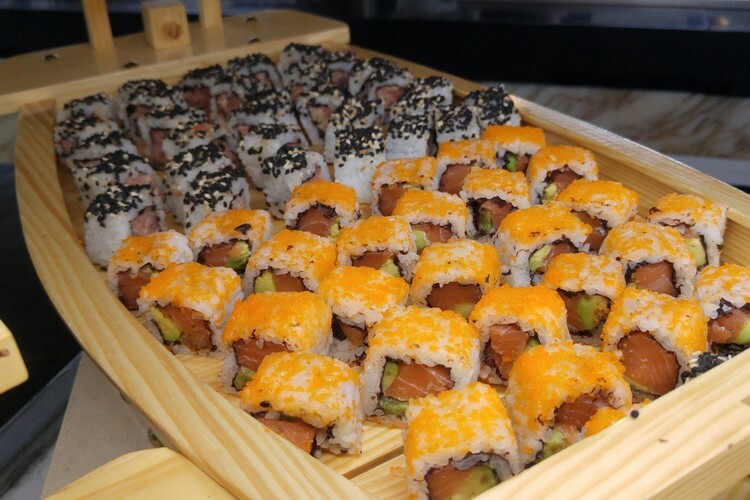 We’re glad they actually use fresh salmon and tuna for their sushi rolls. Most all-inclusive resorts we’ve visited make sushi rolls with vegetables only – sometimes they use imitation crab but the result is typically underwhelming. The sushi at the Grand Buffet was legit. We may have eaten half of that wooden boat of salmon and avocado rolls. It was tasty. 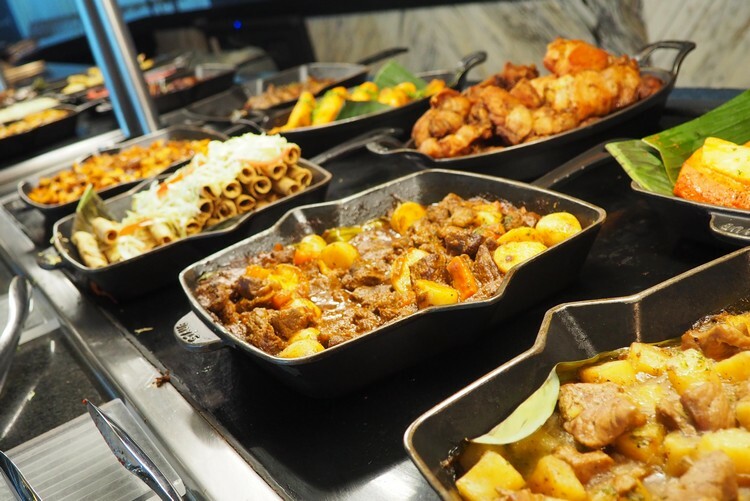 Variety of hot Mexican cuisine at the Grand Buffet. Variety of pizzas available. The meat lovers slice was very good. 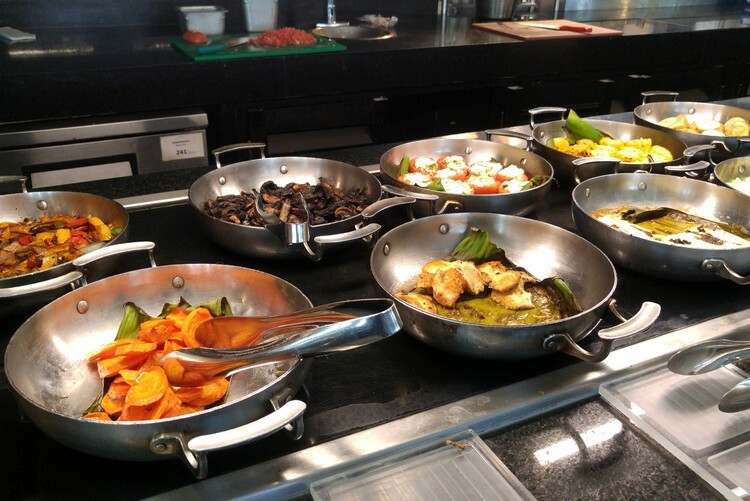 Hot food selection at the lunch buffet, located in the main Lobby building. Lunch buffet for kids. The table is even lower to the ground so kids can serve themselves. Lunch buffet offerings near the pool. 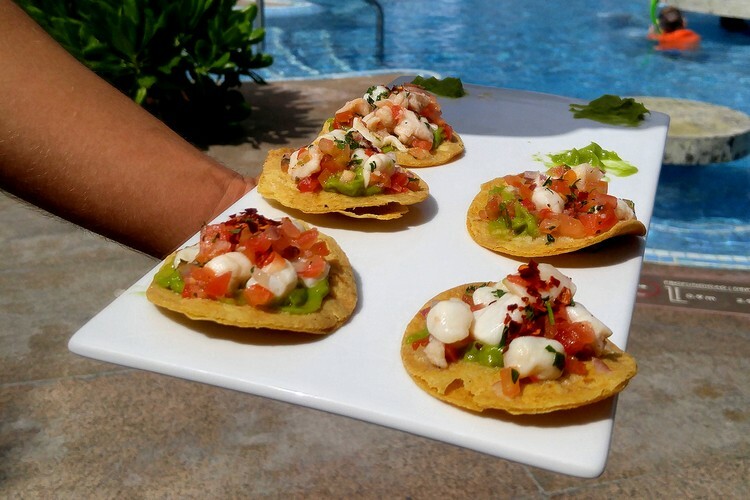 Seafood options at the poolside buffet. Not a bad spread! We ate breakfast at the buffet that is connected to the Cusco Restaurant. 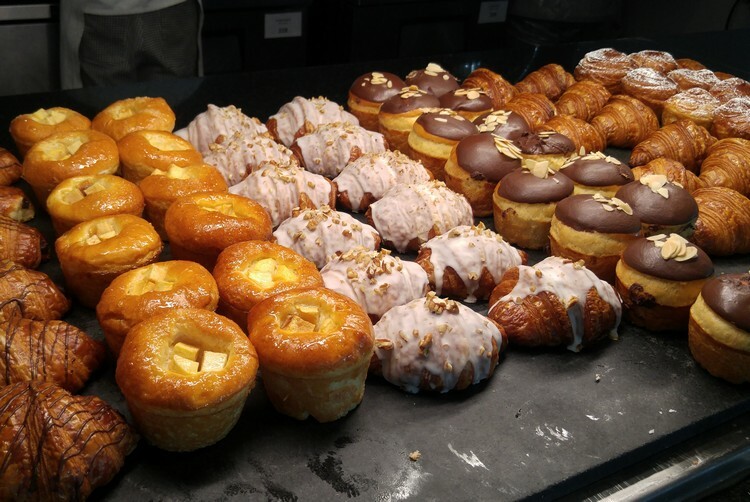 It’s an extensive buffet with an omelette/egg station, fresh smoothies and yogurt blends, fresh fruit and cheeses, fresh pastries and donuts (see above photo), and standard hot items like ham, bacon, sausages, scrambled eggs, potatoes, etc. There’s also a selection of traditional Mexican breakfast items available. 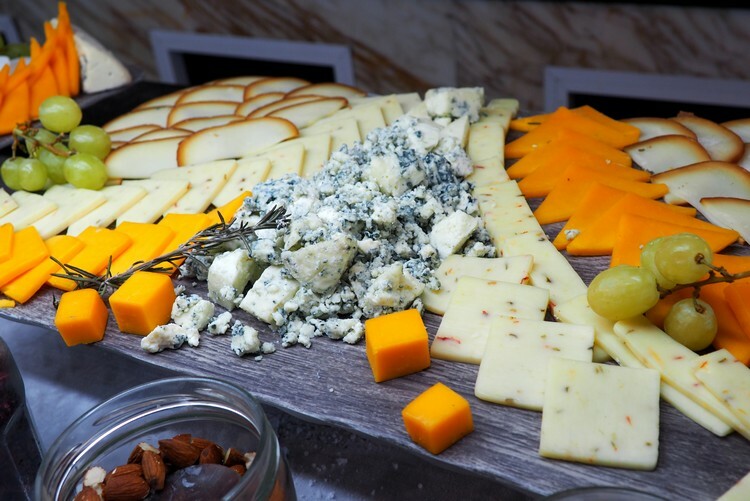 Assortment of fresh artisan cheese, fruit and nuts. 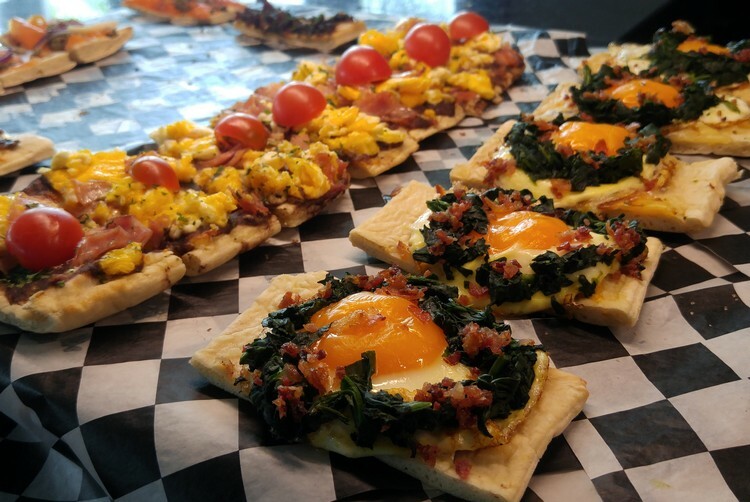 Breakfast flatbread with eggs, bacon and spinach. Delicious. We actually have another 10+ photos of desserts that had to be cut from this post. 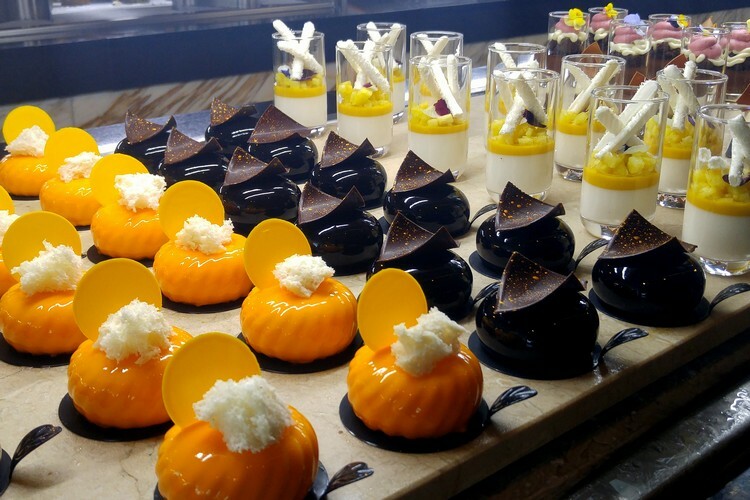 The desserts at the buffets are incredible. 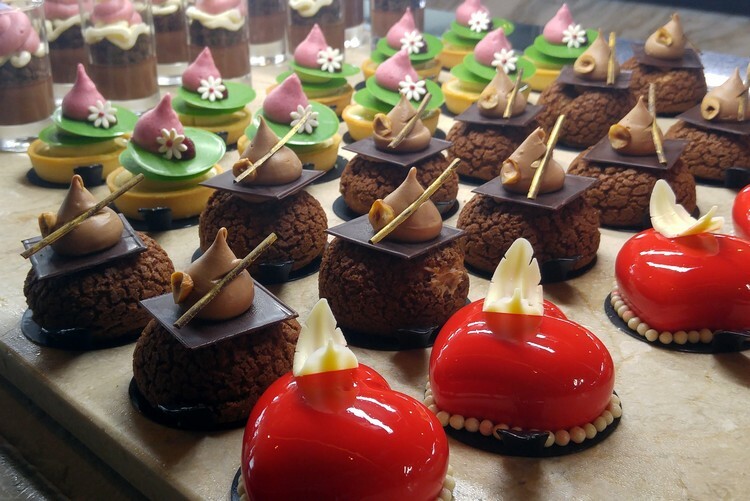 Not only are they deliciously and decadent, they are hand-crafted works of art. 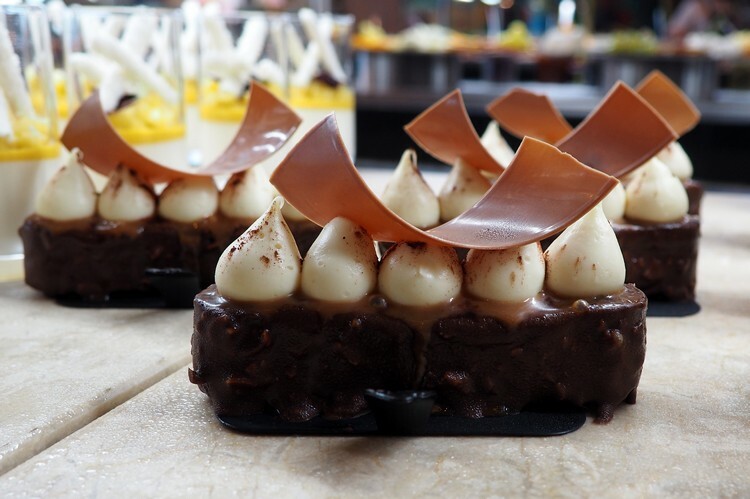 If you have a sweet tooth, the desserts at The Grand will blow your mind. 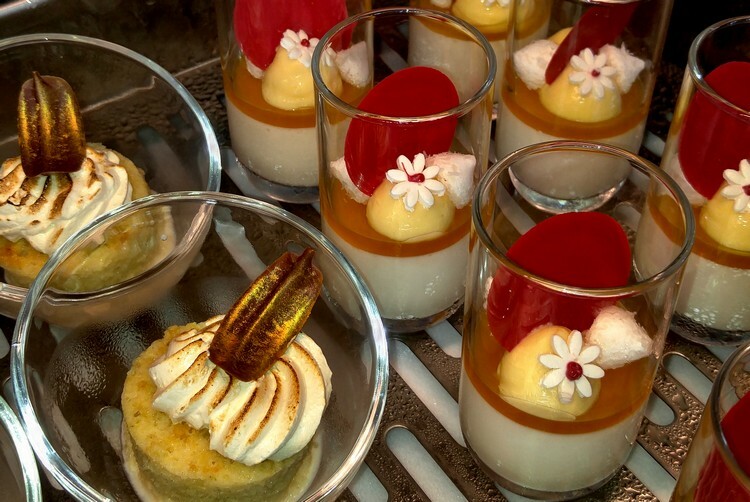 For the record, we did NOT sample all of these desserts. That would be too dangerous. Dessert buffet makes this boy very happy. Where to begin?! Open-faced small bites at the Tapas & Vino wine bar. 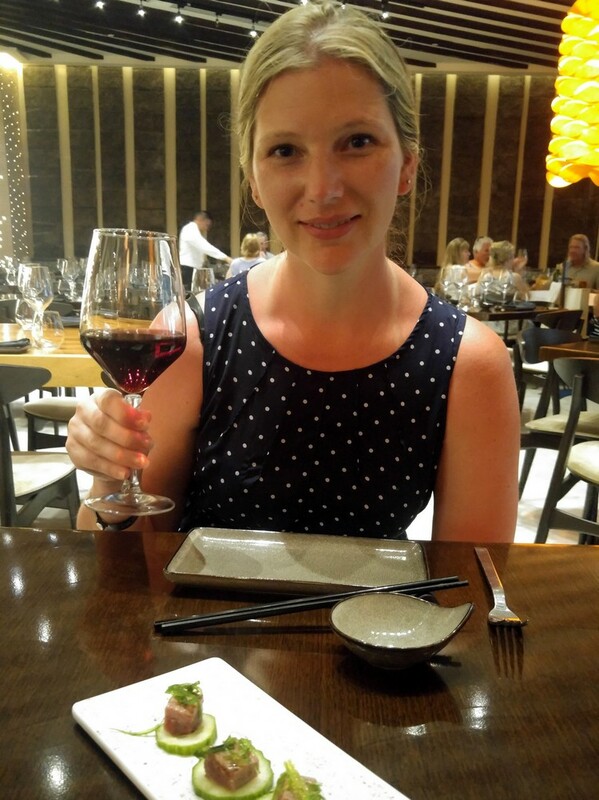 Our favorite restaurant at The Grand at Moon Palace is Jade – we dined there twice during our 4-night visit. 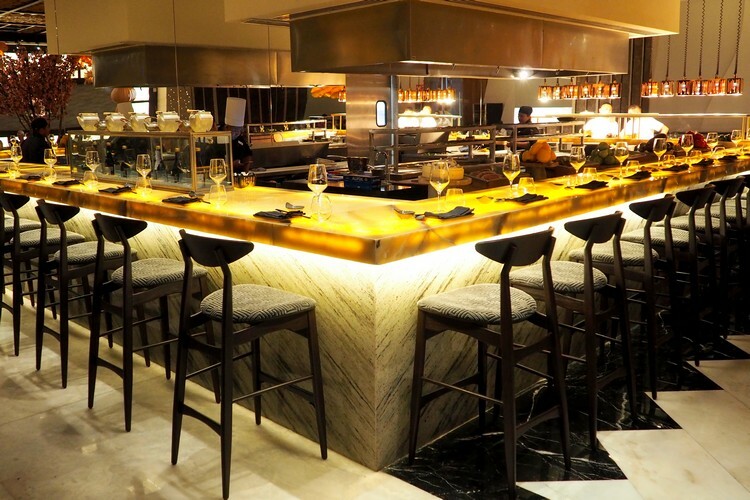 Jade serves delicious contemporary Asian cuisine that includes fresh sushi, yakitori, seafood and grilled wagyu beef. Below are a few of the dishes we sampled at Jade Restaurant. 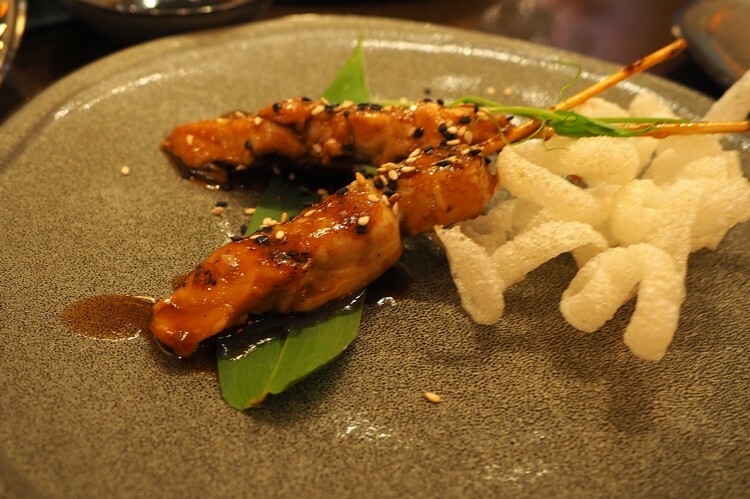 Yakitori – grilled chicken skewers with teriyaki sauce and sesame seeds. 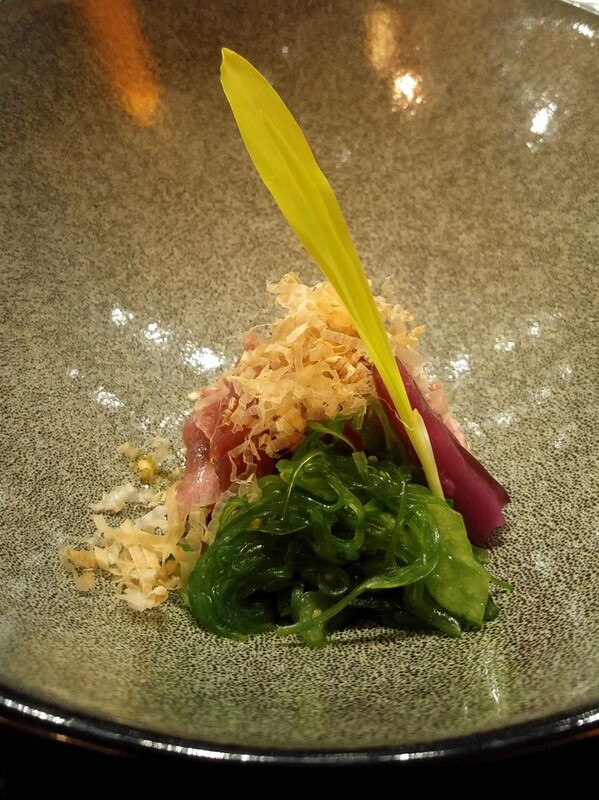 Fresh tuna appetizer with seaweed salad. 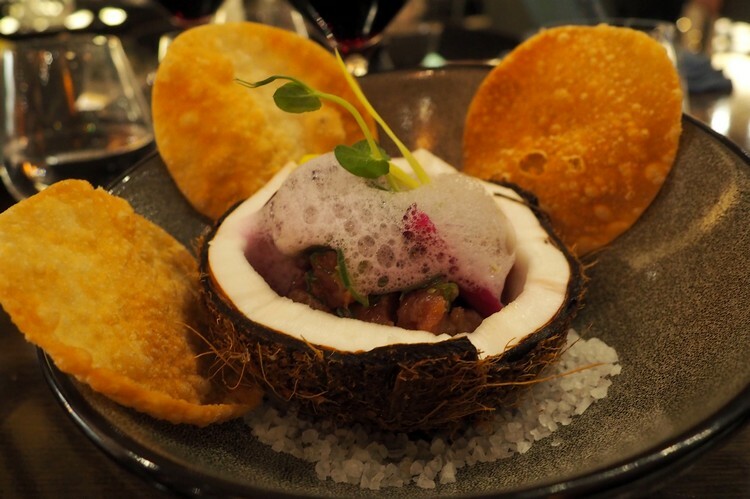 Tuna poke served in a coconut bowl. This was Nicole’s favourite dish from our visit. 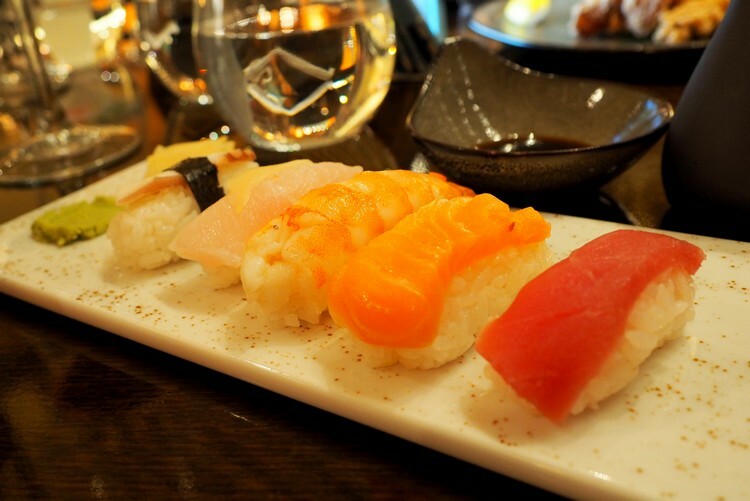 Assortment of fresh nigiri sushi. 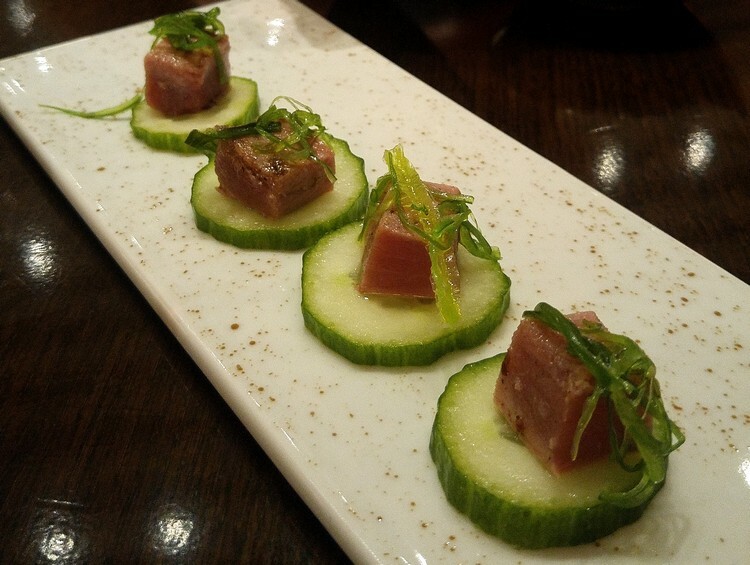 Appetizer seared tuna on cucumber with seaweed garnish. 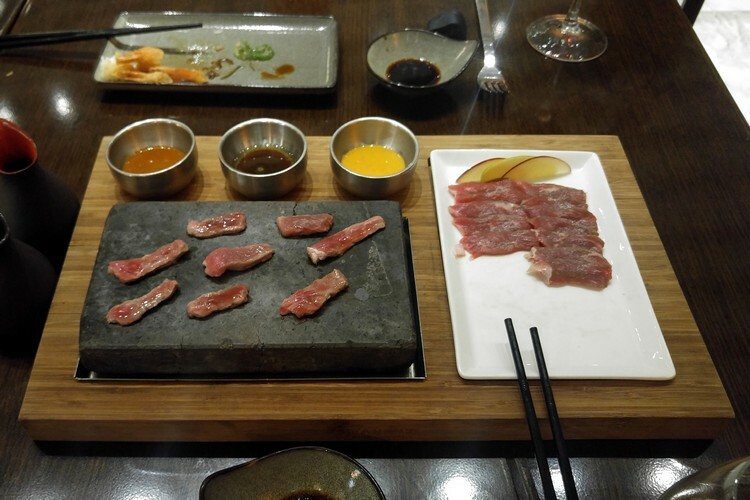 Wagyu beef – this was Cam’s favourite dish. 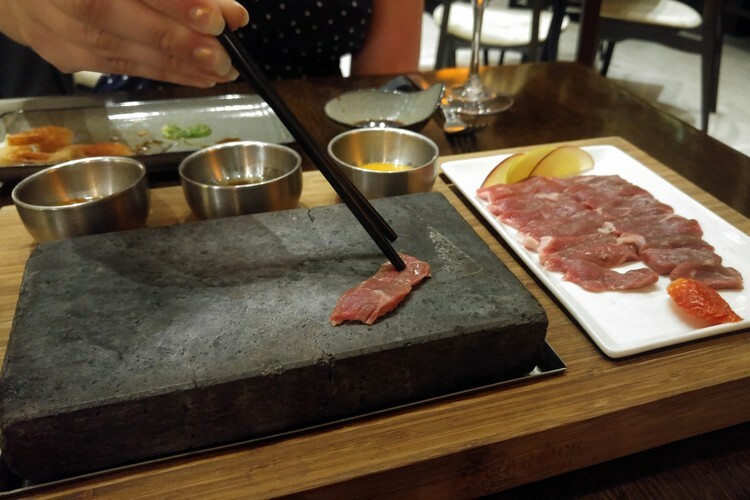 The raw beef is thinly sliced and served with a very hot grilling stone. You place the beef on the the hot plate and cook to your liking. Then you dip the meat in one of three sauces. So good (and fun!). 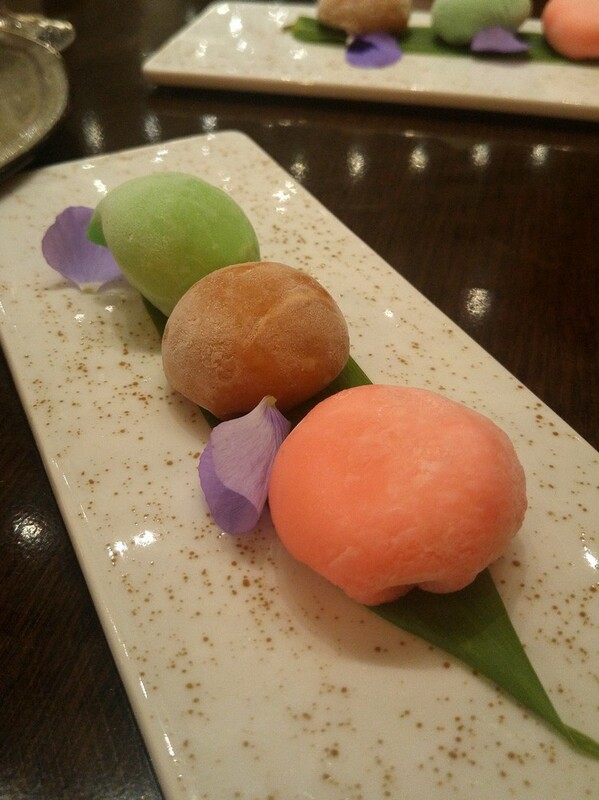 For dessert – ice cream balls covered in Japanese rice dough. The fresh pasta we ate at Tavola was fantastic. 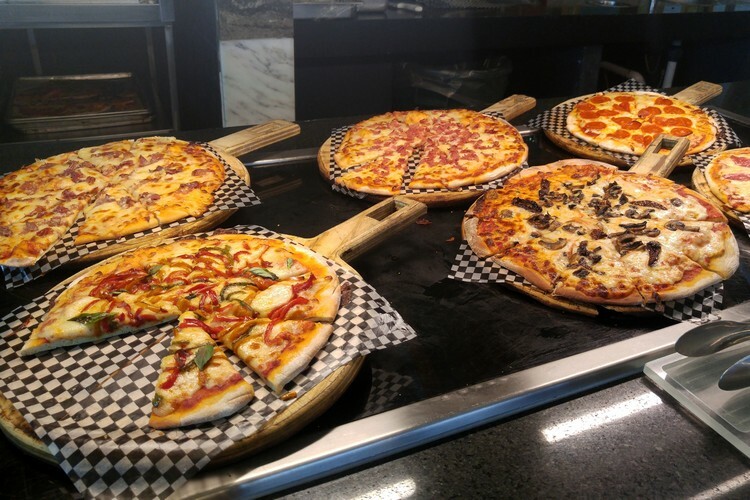 You can also order a wide variety of hand-crafted pizza that are cooked to perfection in its wood burning oven. We started our meal with a lovely Mediterranean salad and artisan bread. Our boys enjoyed the simple penne pasta with butter. 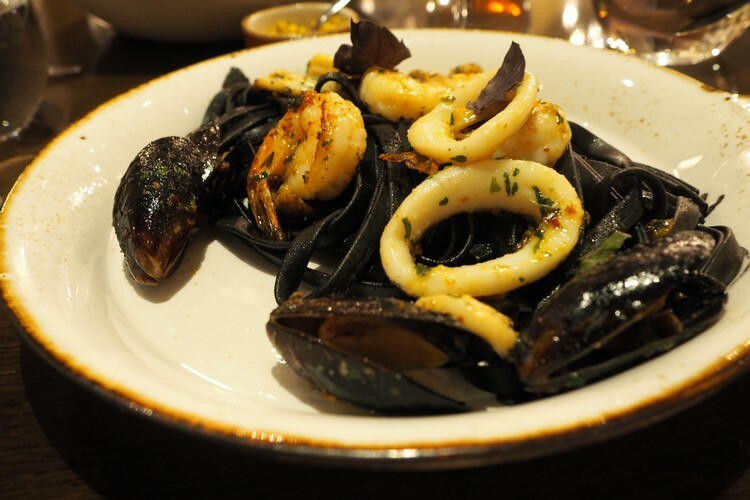 This is the seafood fettuccine with black ink pasta. I (Cam) foolishly wore a white T-shirt that is now no longer with us. I accidentally dropped one of those fat garlic butter prawns on my plate and it splashed the black ink from the pasta all over my white shirt. Doh! It was totally worth it though. 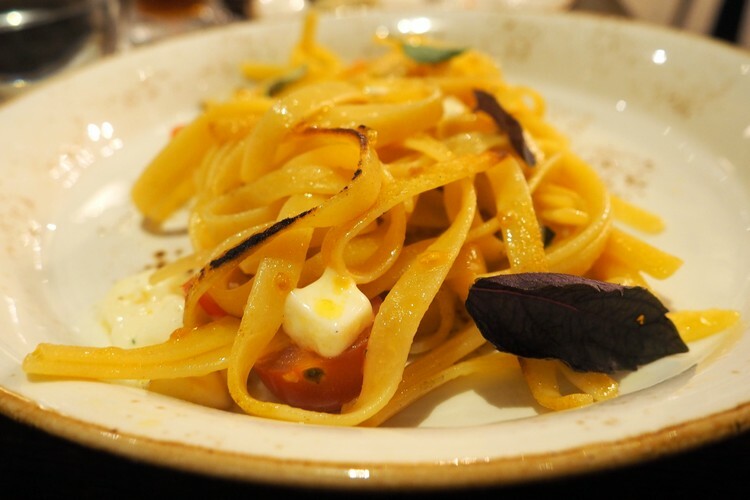 Nicole ordered the simple Caprese Fettuccine with fresh tomato, mozzarella and basil. These soft, sugary stuffed pastries were melt-in-your-mouth amazing. 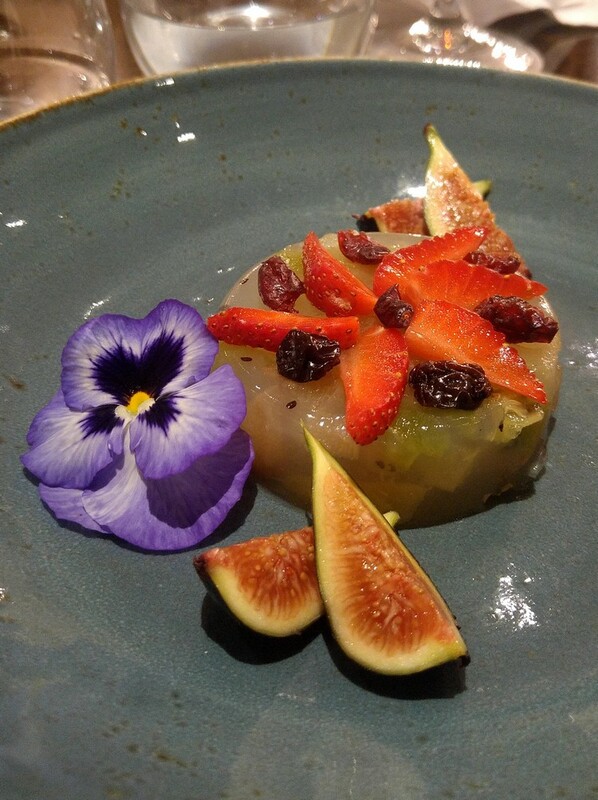 The chef prepared this dairy free dessert for Connor, who has a dairy allergy. 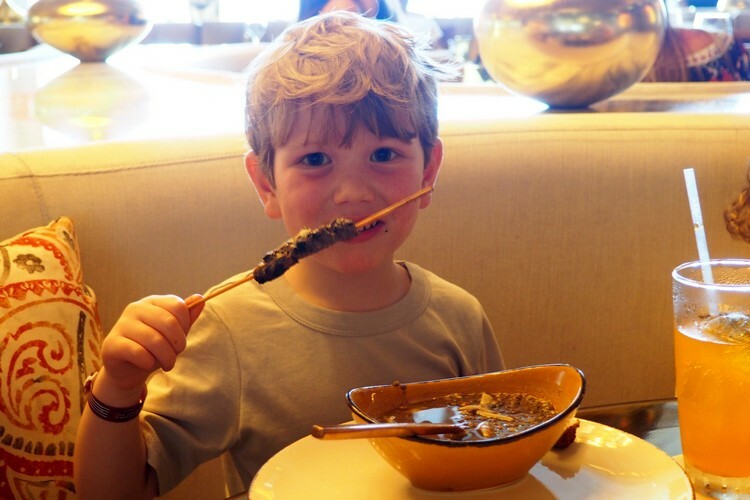 We were pleased with how attentive and accommodating the restaurants are to food allergies. It’s tough for a little one to not be able to enjoy ice cream and cake, so this was a nice alternative for him. 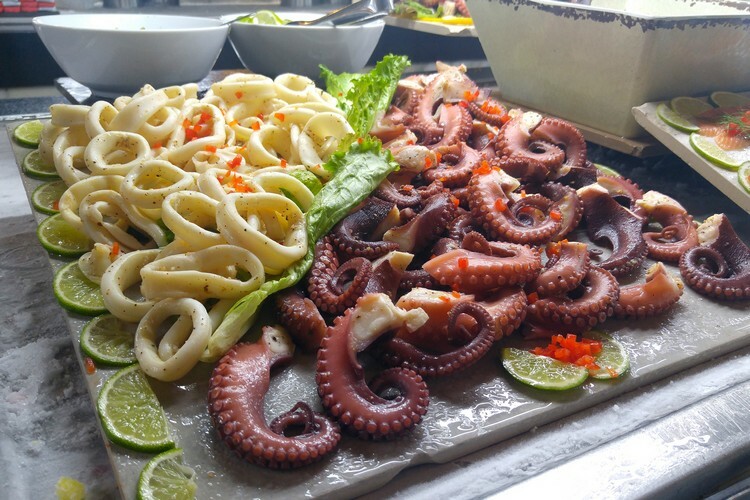 Cusco Restaurant is located near the beach, which is quite far from the Lobby building. 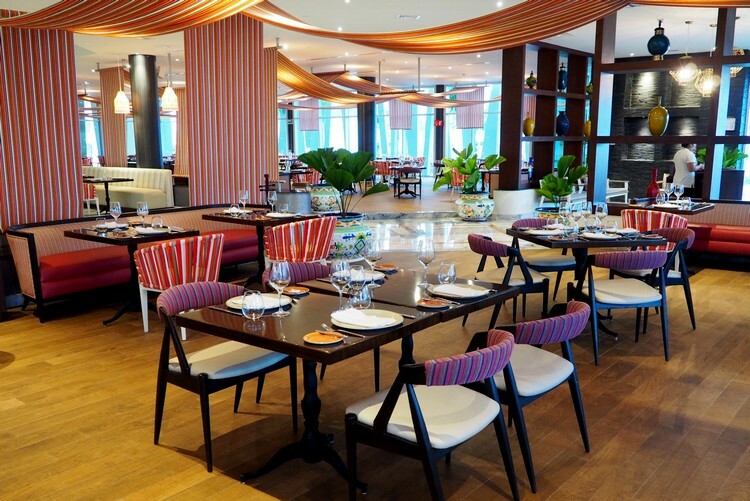 Most of the restaurants are located in the Lobby building, so Cusco doesn’t draw as many guests in the evening. Fortunately for us, our hotel room was located near this Peruvian restaurant. 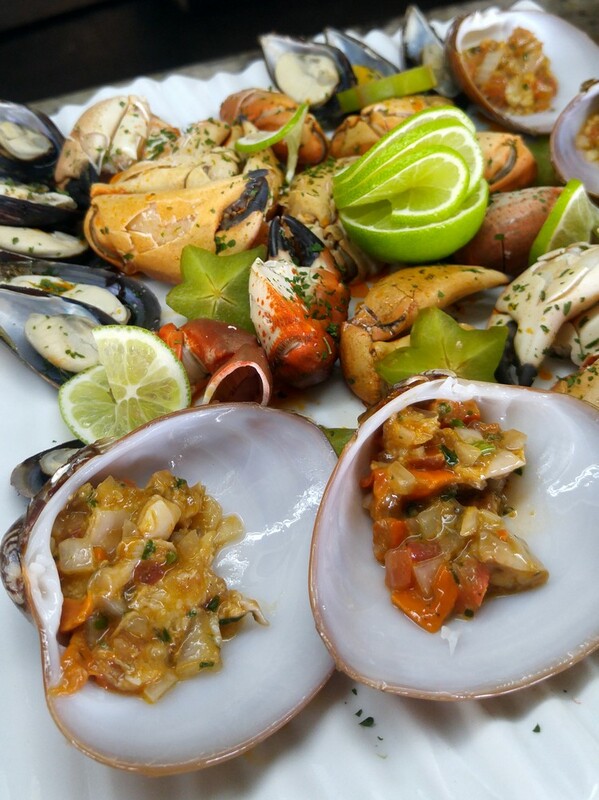 We love Peruvian food but it’s not easy to find, especially at an all-inclusive resort. 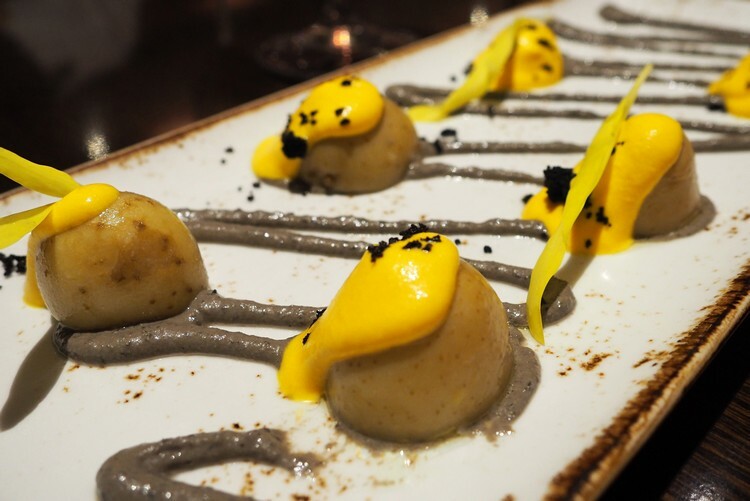 Below are a few photos from our memorable dinner at Cusco. 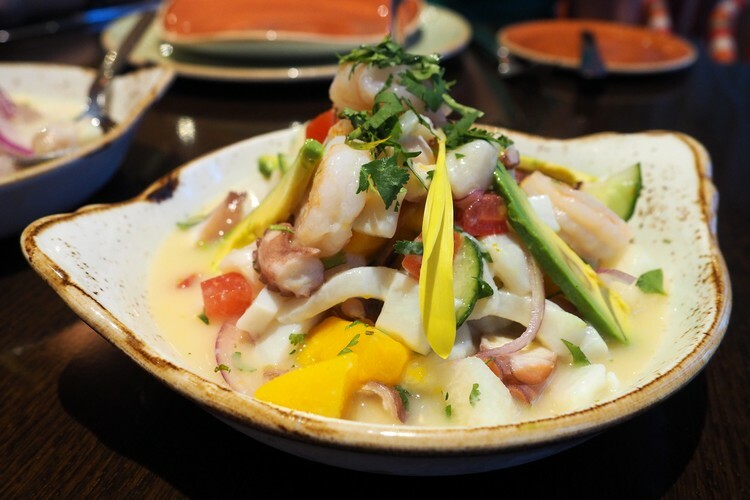 This may have been one of our favourite bowls of ceviche – ever! The flavours exploded in our mouths. 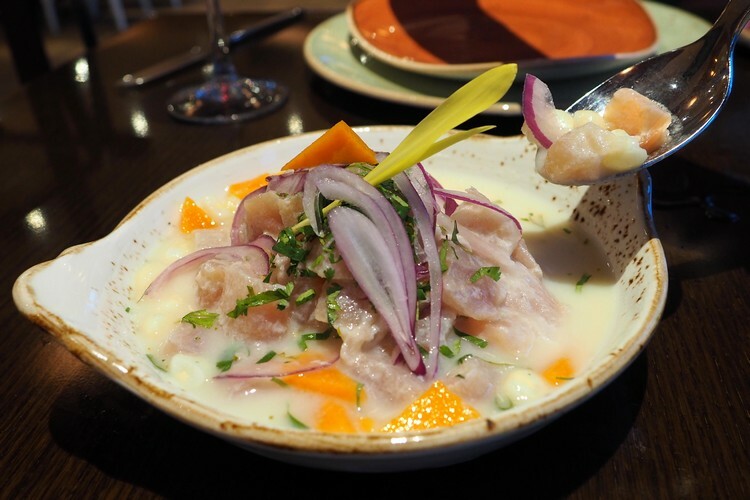 Cusco offers a variety of ceviche dishes. We ordered two as our appetizers. I forget what this dish is called. Let’s call it pretty potatoes. 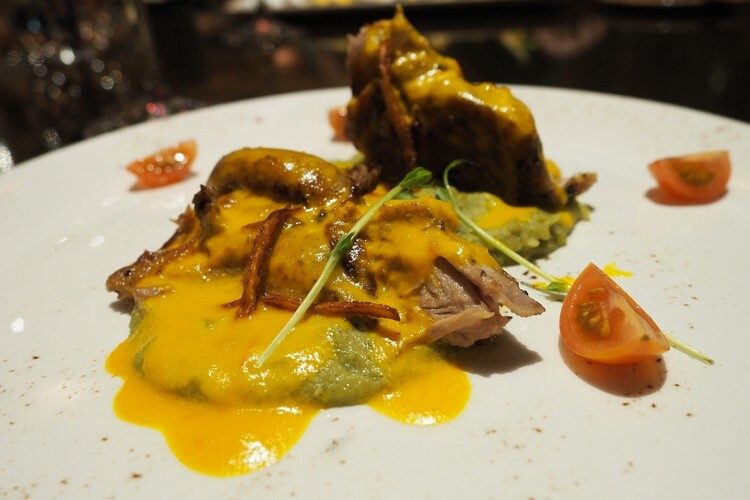 Succulent roasted duck served on a root vegetable mash. The meat literally fell of my fork. 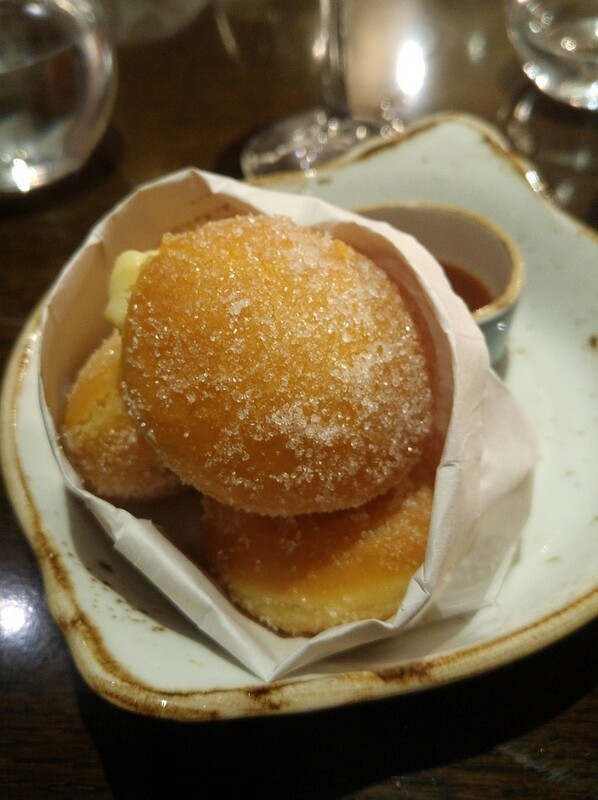 I also forget the name of this dessert. It tasted like a rich, creamy pumpkin pie mouse. Delicious. We ate lunch at Habibi Lebanase Restaurant on our second day. 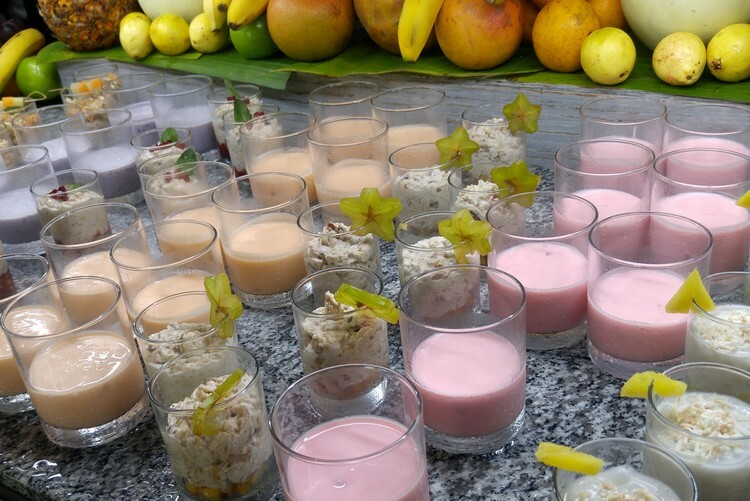 We continue to be impressed by the variety of food options available under the all-inclusive package. 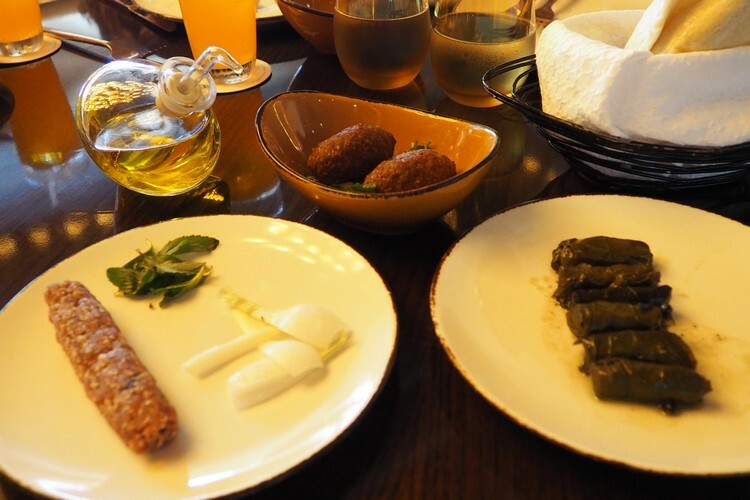 Our boys love Persian food so we were excited to sample some dishes that the were familiar to them. 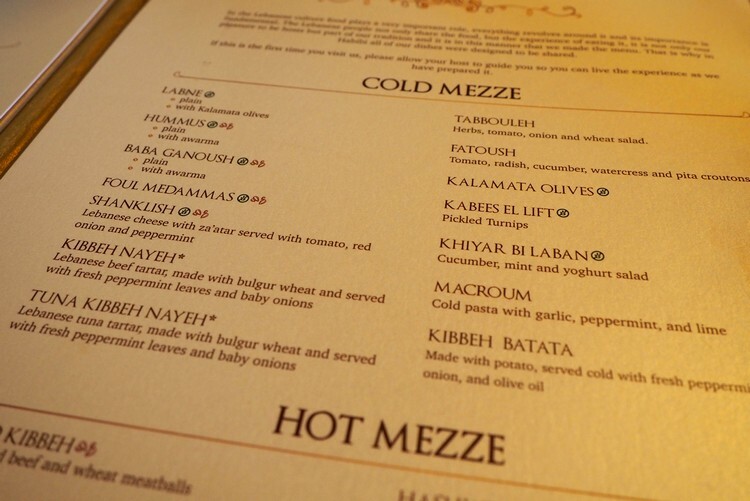 Because it was lunch, we opted for a variety of hot and cold mezze dishes instead of an entree. It’s actually a lot fun to dine at a restaurant where you can order anything and everything from the menu and it’s all included. We didn’t hold back. 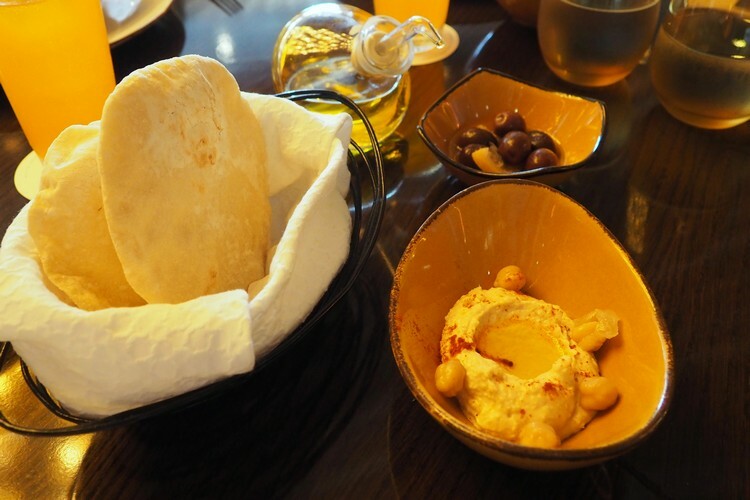 We ordered the hummus, shanklish, tabbouleh, kalamata olives and warm pita bread as our pre-mezze appetizers. It was another memorable meal. 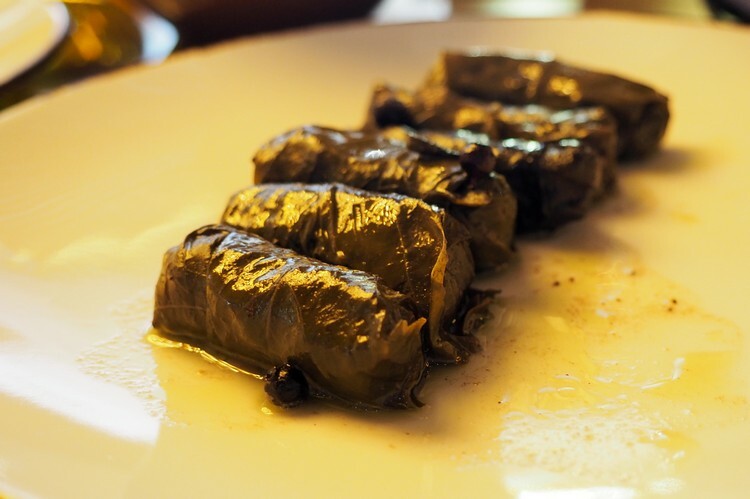 Dolma appetizer – meat and rice wrapped in grape leaves. 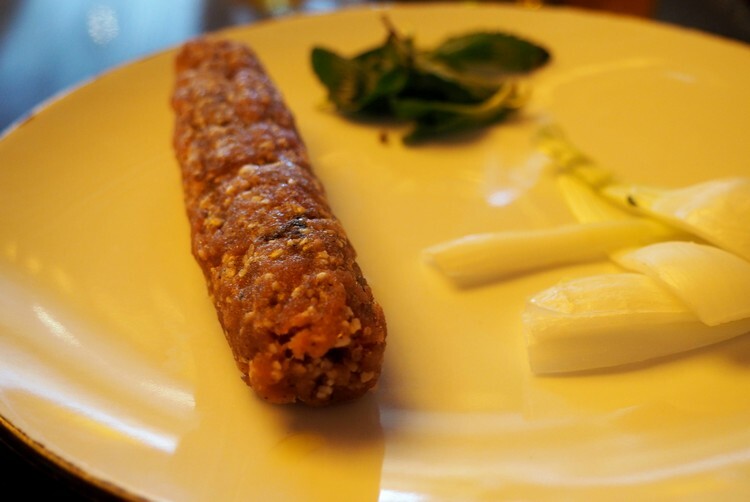 Tuna Kibbeh Niyeh – Lebanese tuna tartar with bulgar wheat, served with peppermint and onion. 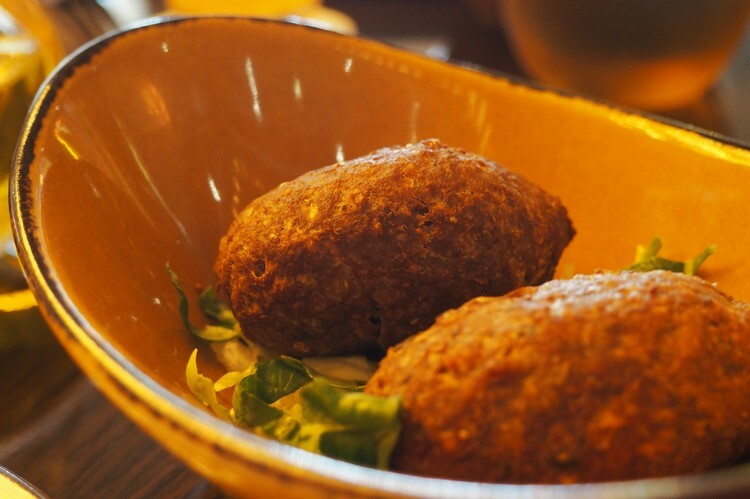 I believe these are the Lebanese Falafels, but I’m not sure. Hummus, kalamata olives and warm pita bread. We could eat this all day long. 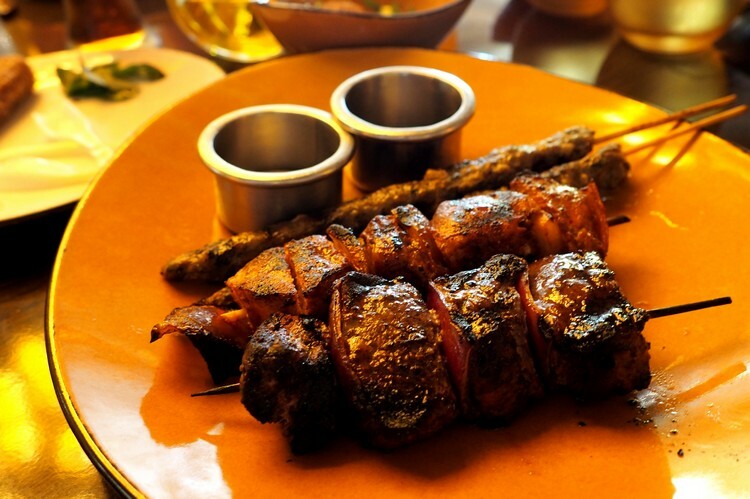 Trio of grilled meat on a stick – ground lamb kebabs, beef kebabs and marinated chicken. This boy loves meat on a stick. He also enjoyed the lentil soup. The poolside service was very nice, too. These seafood mini-tacos were incredible. This is Los Tacos restaurant. 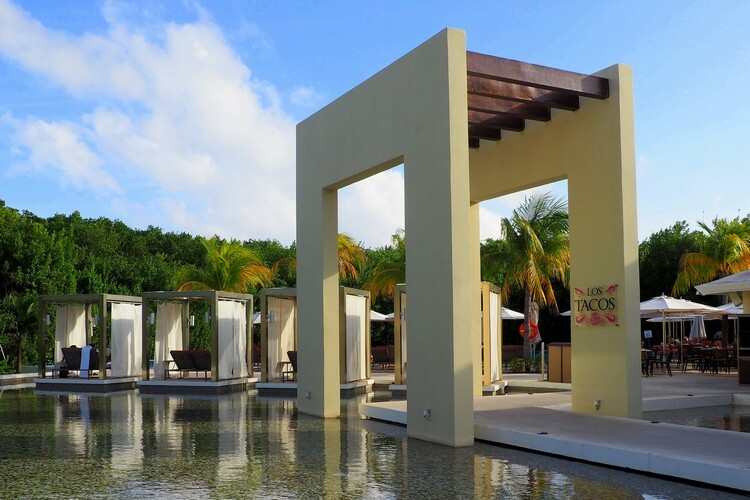 It’s ideally situated in front of an infinity pool surrounded by trees and native mangrove. 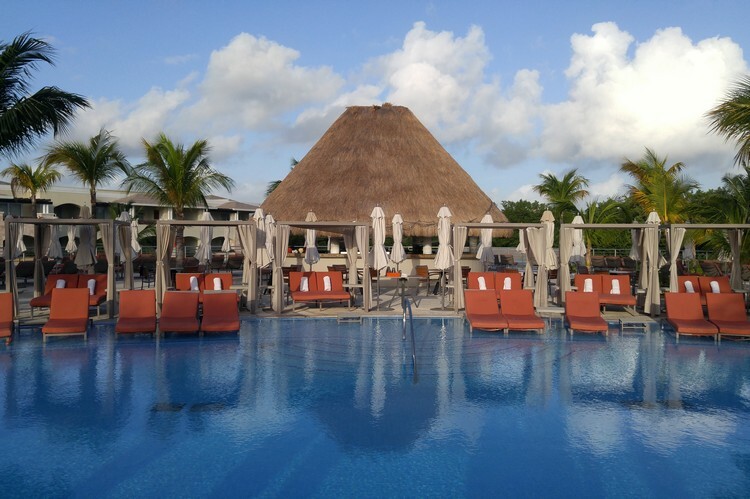 You can relax in one of these inviting cabanas and eat endless amounts of steak, chicken or fish tacos served with fresh salsa and guacamole. Perfect location for a late lunch. 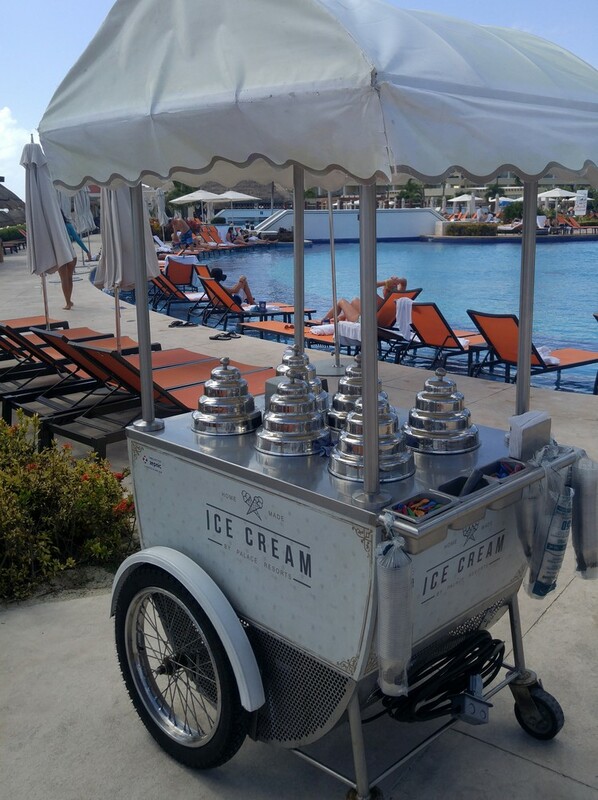 Fresh ice cream on a hot day at the pool is always a good idea. Our youngest, Connor, is allergic to raw forms of dairy and eggs. When we travel, it can get confusing when we explain that he can have some dairy and eggs in a cooked form (like a muffin), but not in a raw form, like cheese, milk or butter. Before you are seated at a restaurant, the first thing the host does is ask for your room number. Then they ask if anyone has a food allergy. The servers make note of it and the kitchen is informed of the allergy. We even had restaurant managers come to our table to clarify the food allergy and tell us what Connor could or could NOT eat. Being parents of a boy with allergies, this made us feel very good. We felt confident that our boy was looked after and cared for. One night, Connor wanted chicken nuggets. Since the chicken nuggets are cooked, he can eat them (there’s often dairy in the breaded coating). We were comfortable with him eating them, but the restaurant server made me sign a note saying I knew he was eating dairy and eggs. It was to ensure that if something went wrong, I was responsible. It was nice seeing a formal system around food allergies. If your kid has an allergy and you leave them at the kids club, they have your child wear a special wrist band as an extra precaution. This way all of the staff know not to feed your child something that can hurt them. When room service is included you have to order breakfast in bed, right? Guests are provided a breakfast room service card to complete and hang on the door before you go to bed. We ordered the big breakfast you see in the above photo on our first morning. It was a lot of food! 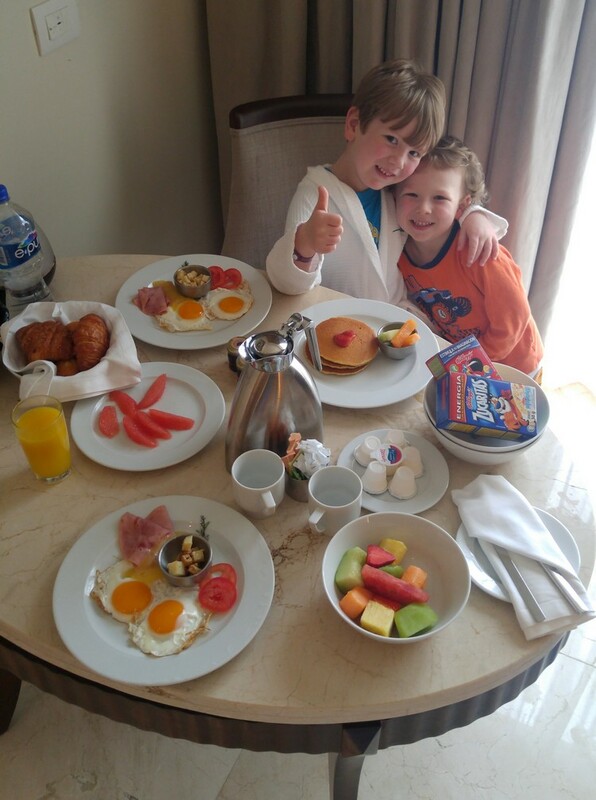 We ate at the breakfast buffet most mornings but still ordered fresh coffee, pastries and fruit via room service. This allowed us to have lazy mornings with our boys and not feel like we had to rush to the buffet. It was a great way to start the day. 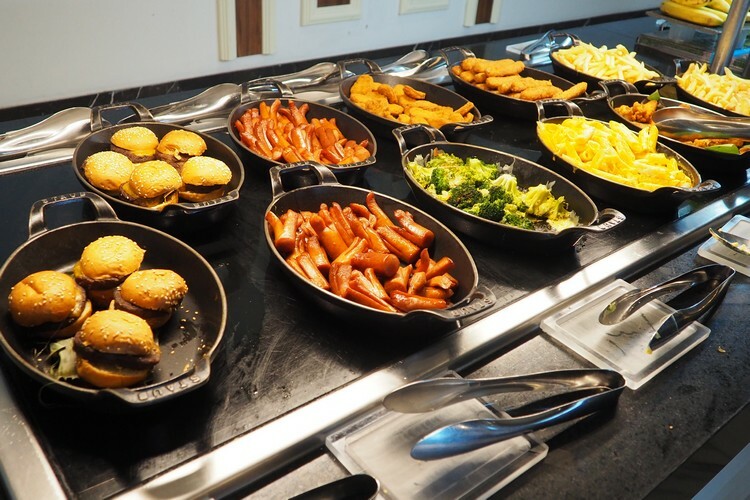 The Grand offers room service throughout the day, but we only took advantage for breakfast. 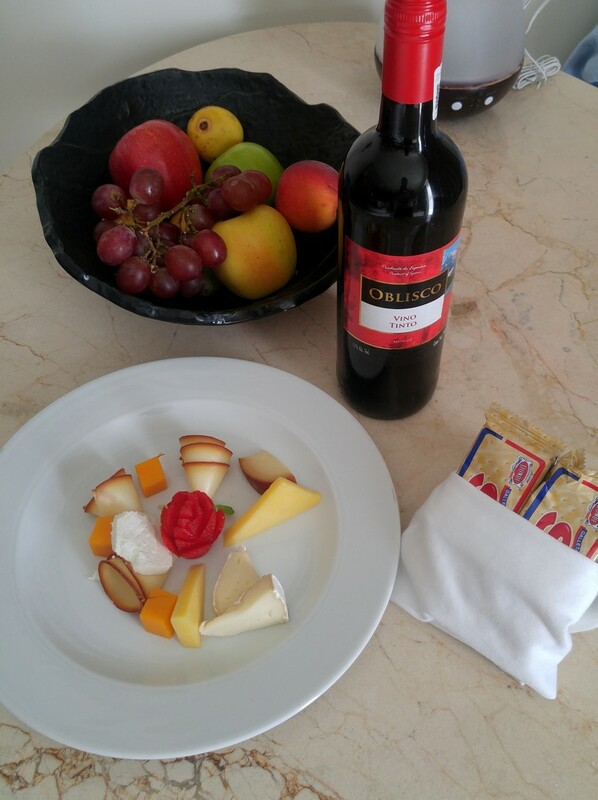 One afternoon, we returned to our room and found a cheese platter and bottle of wine waiting for us. We love this! The little unexpected details do matter. What’s in your closet? 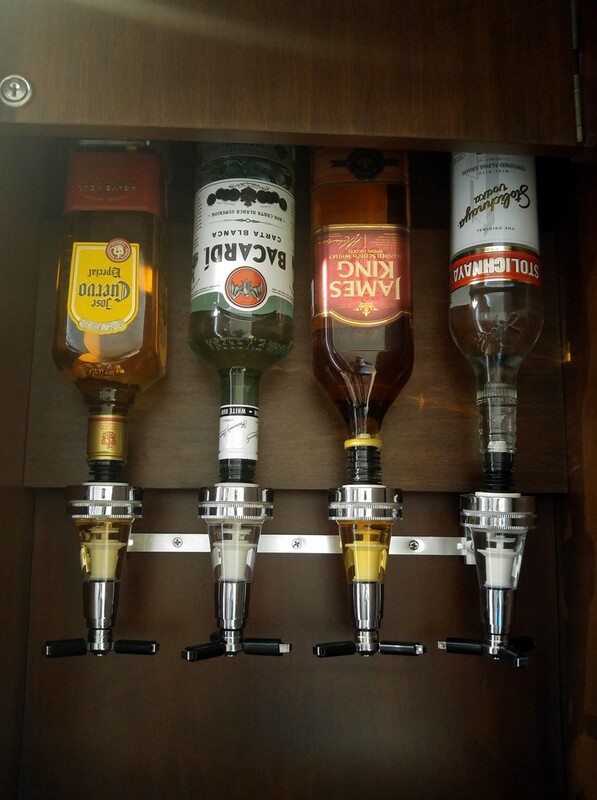 This is what’s in the closet at The Grand – unlimited alcohol. 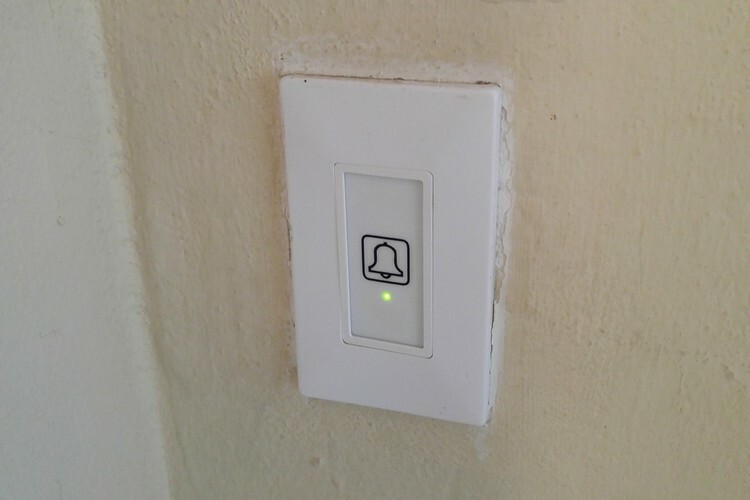 When you want your room made up (or not to be disturbed), you can hit a button inside your room that will notify house keeping. It’s the modern version of the ‘do not disturb’ door hanger that we’re all familiar with. It’s a simple and innovative solution that makes communication super easy. We stayed in a Garden View Suite on the 3rd Floor. It’s a spacious room with two double beds and a huge jacuzzi. The bathroom is quite big and it has a large shower with a bench. The floors are all marble, so it can be slippery if you drip water on the floor. 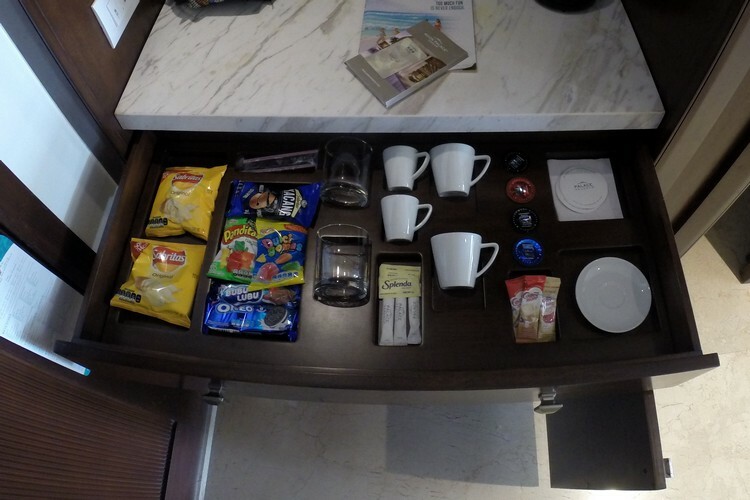 Rooms come fully stocked with a mini bar, snacks (chips and oreo cookies) and coffee (real coffee, not instant coffee). The beds, pillow and linen are very comfortable. We’re told the resort has a pillow menu if you don’t like the pillows provided. We slept well during our stay. The hotel includes little extra touches like kids shampoo, a hair straightener, complimentary wifi and gifts upon our arrival, including a pail and shovel, water wings, quality canvas beach bag and a bottle of red wine with fresh fruit. Braydon LOVED this giant jacuzzi. He had a soak every morning while watching cartoons. 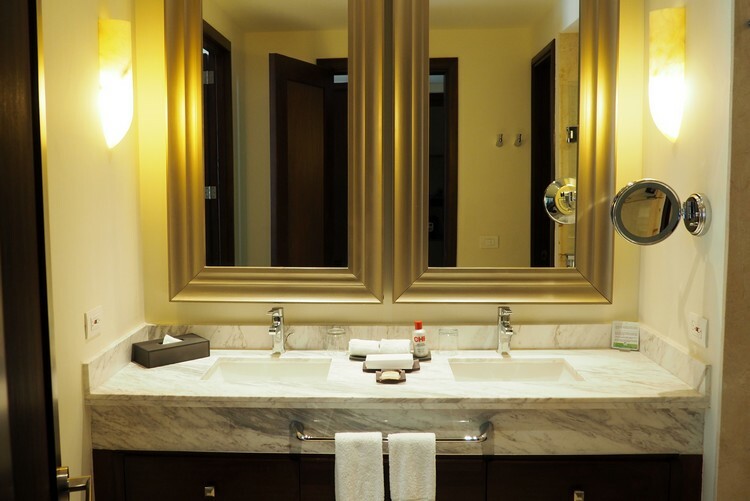 Large double sink vanity in the bathroom. One of the buildings illuminated at night. This property is HUGE. Comfy two person lounger on our private balcony. View from our 3rd floor balcony. The landscaping is still quite new. This area will be thick and lush in a few years. You can see the top of the water slides in the distance. 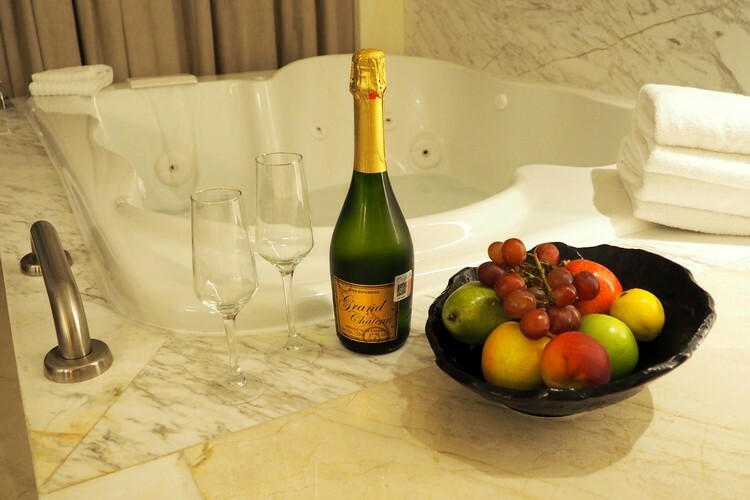 We received a complimentary bottle of bubbly that was enjoyed in a whirpool of bubbles. Views of the courtyard inside our building. There are several buildings on the property. 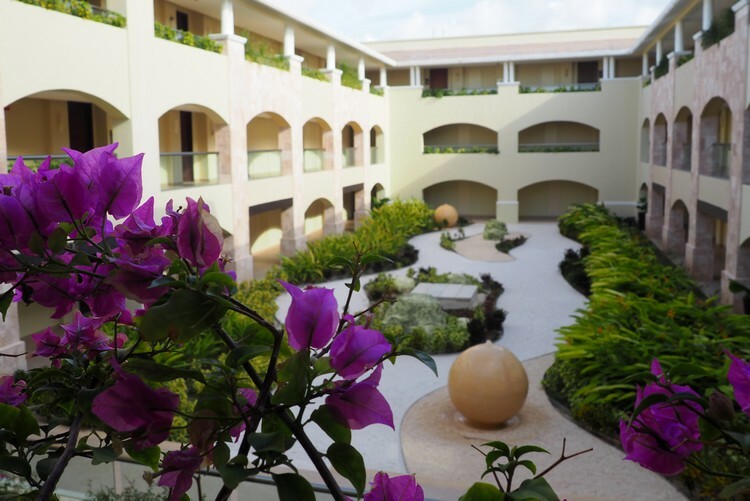 An added bonus is that you get access to The Grand’s sister resorts – Sunrise and Nizuc. 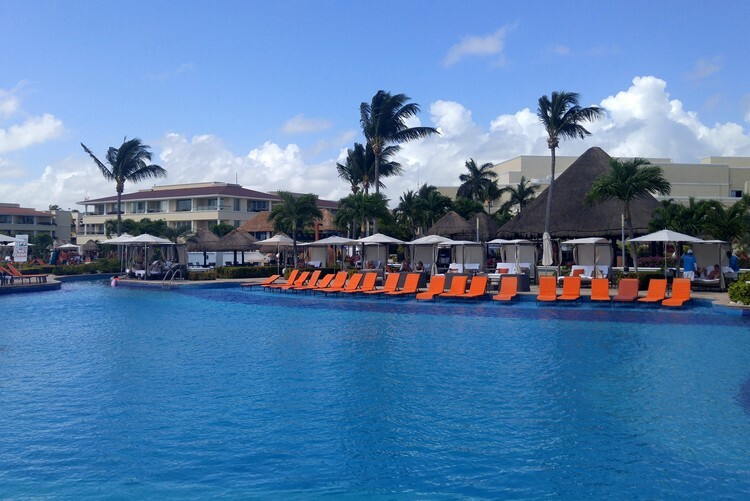 During our stay we explored all 3 resorts and spent time at the Sunrise pool. 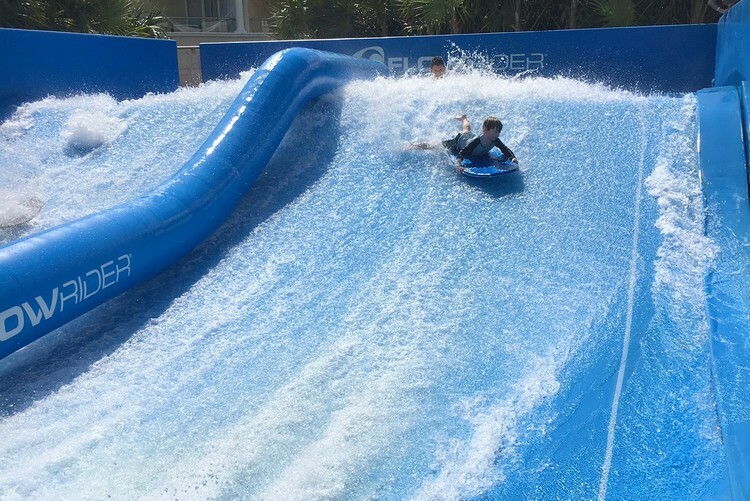 This is where the Flowrider is located (pictured above). 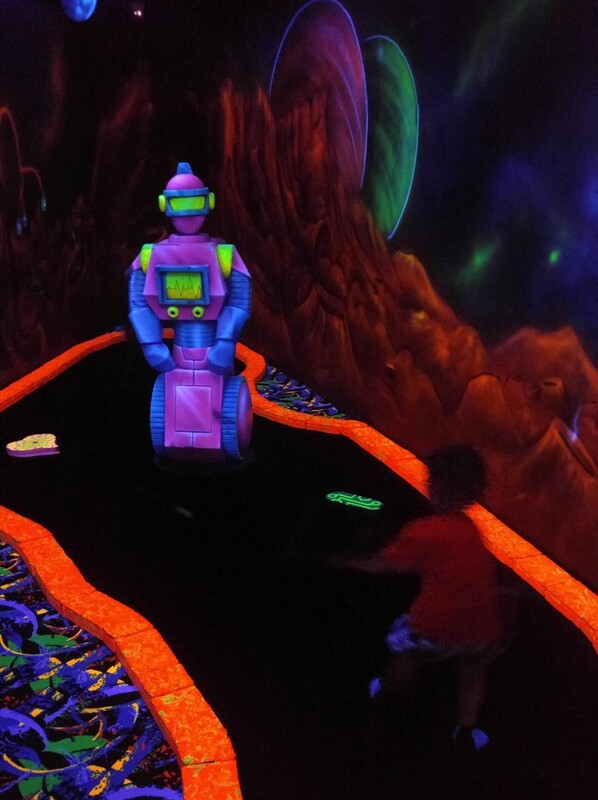 Our oldest son, Braydon, gave it a try and had a blast. Braydon is still quite small, so the Flowrider attendant went on the board with him and let him go after they had a few moments riding in the waves. As soon as the attendant let go, Braydon went flying back to the top. We’re so proud of him for giving it a try! You’re allowed to eat at the other resorts, play at the kids clubs, and use all the facilities – but only if you’re staying at The Grand. It doesn’t work the same if you are staying at the other resorts. This is the kids pool at the Sunrise Moon Palace. Water slide at the Sunrise resort. Not as big as the Water Park at The Grand, but still pretty cool. Above and below are photos of the big pool at the Sunrise Resort. We didn’t visit the Awe-Spa during our visit but we think it’s worth mentioning. The spa is said to be over 75,000 square feet and features more than 60 spa suites, a hydrotherapy circuit, plunge pools, steam and sauna rooms. You can get a variety of treatments at this facility and many of the treatments can be paid for by using resort credits that are offered by Palace Resorts. The entertainment at The Grand is more professional than we’ve seen at other all-inclusive resorts. 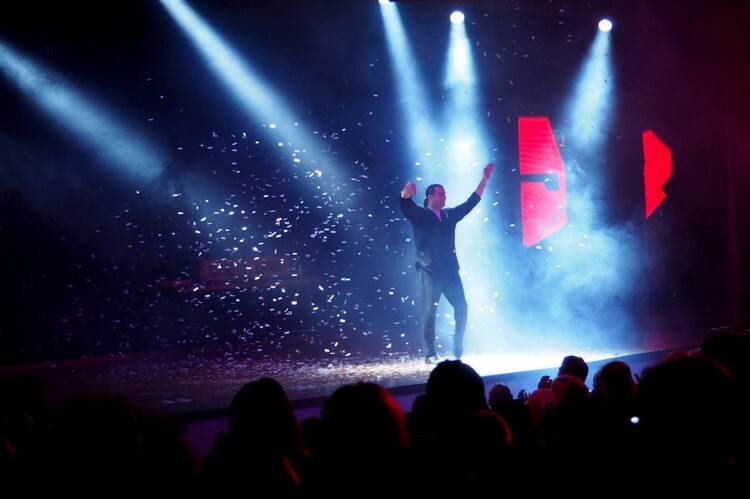 During our visit the resort put on a Magic Show, Michael Jackson impersonator music concert, sand art show and the Lion King show. 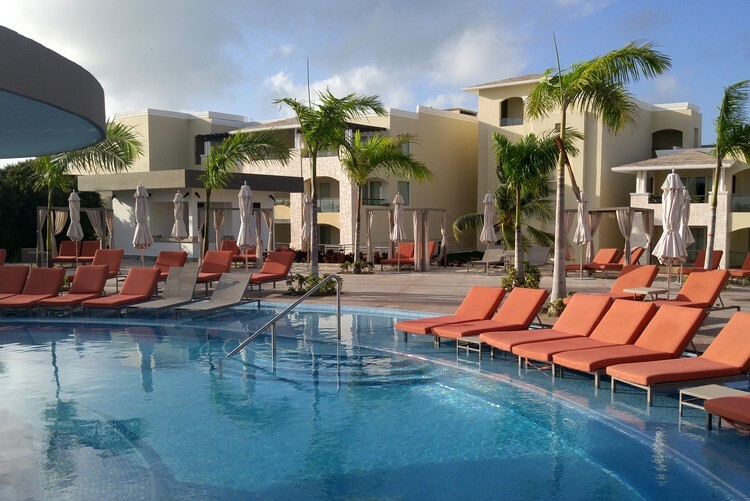 The Grand offers so much that you may not want to leave the resort. Our days were full bouncing from pool to game room to restaurant. 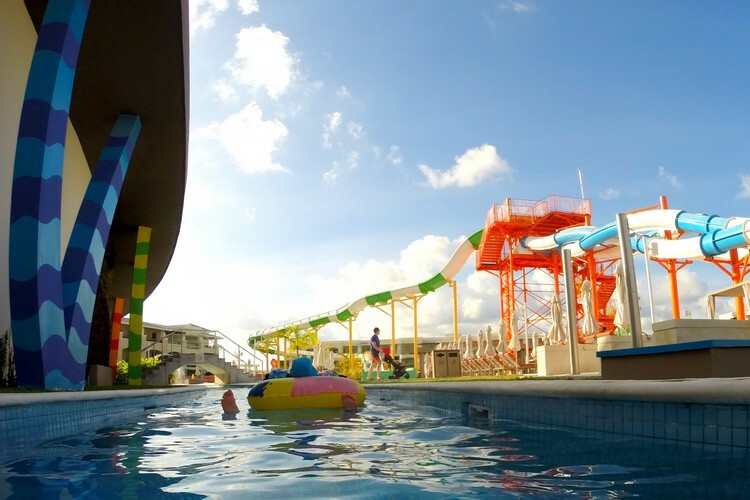 There are plenty of pools, activities, games, shows and restaurants to keep you and your family entertained for days. Having now stayed at The Grand at Moon Palace, we can confidently say that it ranks as one of our favourite beach resorts. It’s not cheap, but you get a lot for your money. 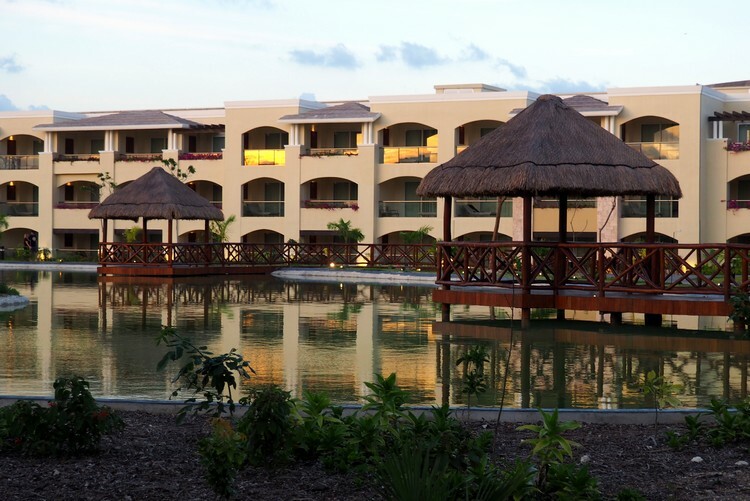 Learn more about The Grand at Moon Palace here. 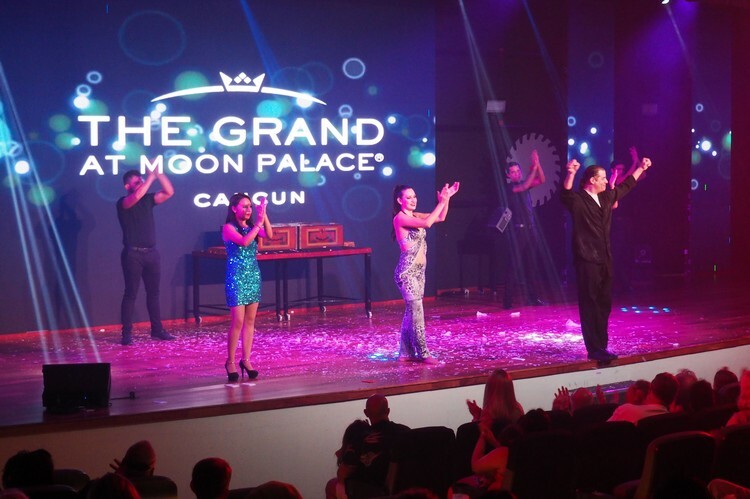 Have you been to The Grand at Moon Palace? Share your feedback in the comments section below. Our readers thank you! Should you add Sayulita to your travel short list? Don’t miss a post. Get new posts delivered to your email inbox. I enjoyed your review and your pictures. Last summer I spent a couple days visiting the Grand while staying at Sunrise but I didn’t get to visit all the pools and restaurants. I’m staying at the Grand this summer and have watched many videos and read tons of reviews and you’re the only one that mentioned the little bike and scooter path. My son will definitely like that. One question I have is the location of the diamond only pool. Is it the one between the Olympic pool and the half moon pool? Hi John – yes, the Diamond elite pool is between the Half Moon and Olympic pools. They are all in the same section of the resort. We didn’t spend any time there. Most of our time was at the newer pools near the beach. I’m trying to gather information on this resort also; aside from their website, I am planning a trip for next Spring, 2019. However, my daughters are 16 & 19 years old…..Is it mostly for families with smaller children? Are there activities for that age? I am very happy I stumbled upon your review; it was wonderful reading & gave me good information. And your boys are very cute! I would say that teenagers would really love this resort. There’s a lot to do and many pools to hang out at. 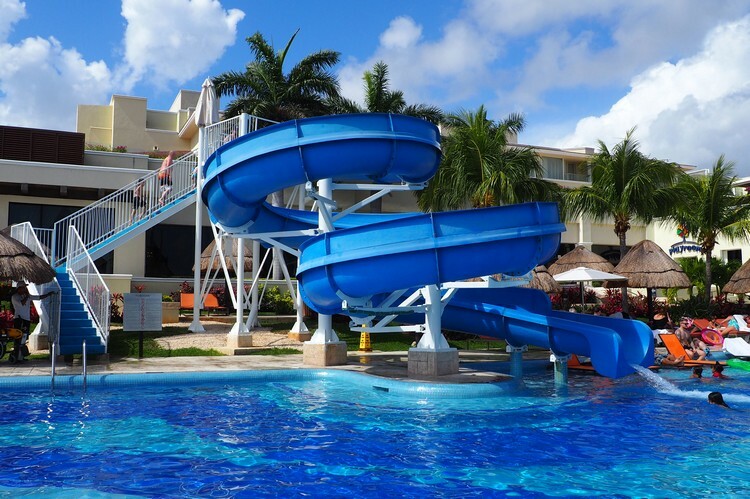 If the waterslides are open, your daughters will love it. They will also like the shows in the evenings. 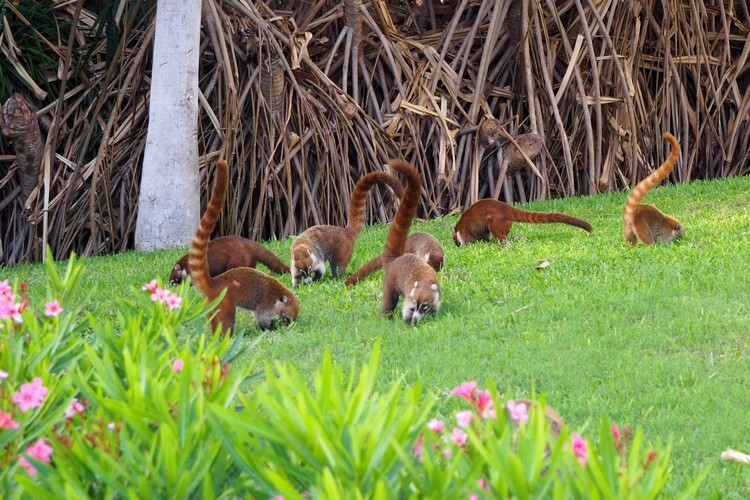 They can also explore the sister resorts too. Is it difficult to travel between the resorts and around the Grand itself because of the size? Did you ever feel like it was overly crowded? It’s really easy to travel between the resorts. We would just take the shuttle and we never waited long. Maybe 10 minutes at most. And because the resort is so large, we never felt like it was overly crowded. We always could find a chair and restaurant seating also wasn’t an issue. Did you notice any seaweed along the beach shore??????? Secondly, are all the photos taken from your trip by you ? Thanks…. Yes – there was seaweed on the beach. Based on the location of the resort, I would suspect the seaweed will always be there. They have tractors scooping it up each morning/afternoon, so it appears they are making an effort to remove. Yes – all of these photos were taken by us on our trip. We just had recent trip from 07/31/2018 to 08/06/2018. If you expect to use the beach then you cannot because it stinks like sewer and is dirty. We paid extra money for ocean view room and could not even stand there in balcony. They never advertise that beach is not usable. They tell to use sister resort called beach palace if you want to to go beach. You pay 35 dollars each way by taxi to go there. They do run buses to go there but only for premium members. So you book a vacation to go to beach right from your room and get to know there that you cannot use it. At least run shuttle service free of cost to beach palace. Hey Shruti we are planning to go to this place in Thanksgiving. Aside from the beach did u have a good time at the resort? Also the ride to the Beach Palace, can u pay for it with the credits? Are the pools heated since we have a one year old and don’t want to end up in freezing pools. Thanks! 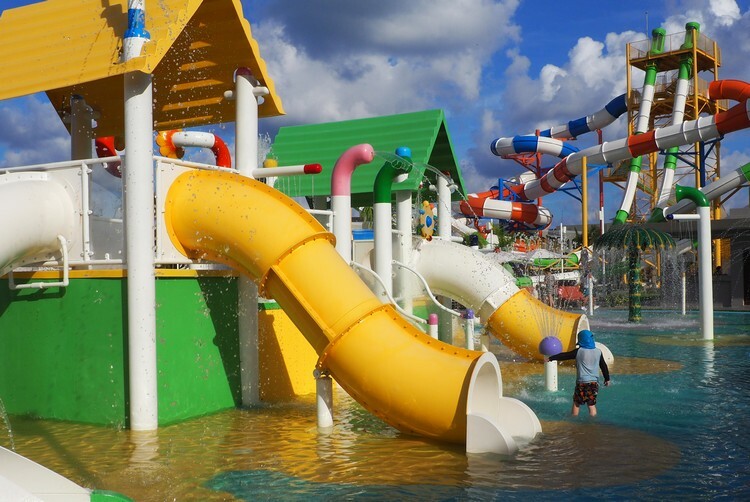 I keep hearing that the water park water slides are unlikely to be open all of 2018 – that they have to be redesigned for safety issues. Such a bummer! If that’s true it is a bummer. But, I’m happy to hear that they are ensuring that everything is safe. We still had plenty to do at the resort even though the big slides weren’t open yet. Hi. Great review! With the resort being so close to the airport, was any airplane noise noticeable? Hello and thank you for the incredible review, comments, and photos! And beautiful family! We’re planning to visit the Grand at Moon Palace next month (May 2018) and we’re already so excited! 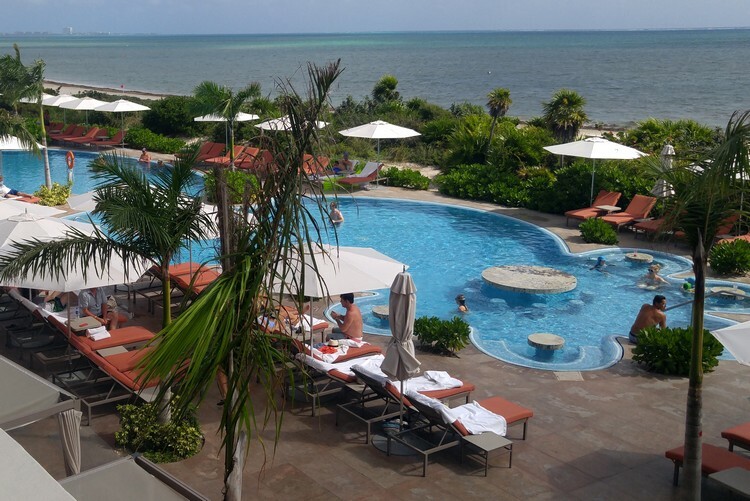 Your review and photos make us feel like we’re already there. Ha ha. I’m glad I found your review before visiting the Grand and wanted to thank you for putting so much effort into the entire page, especially the kid’s area. 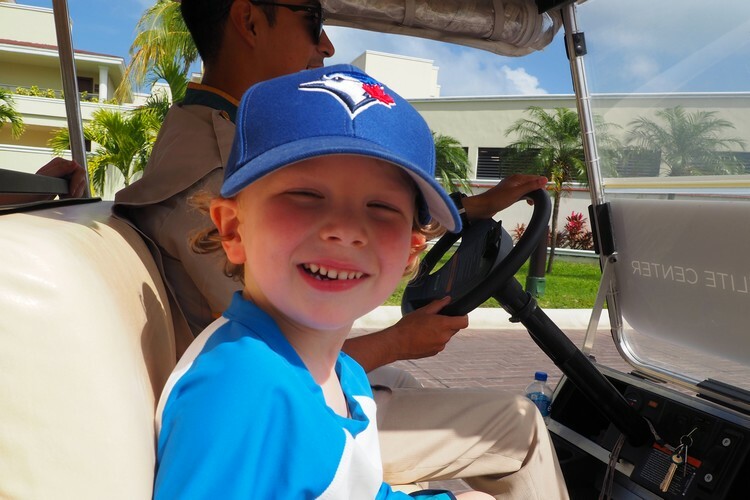 The main reason we chose this resort was because of our soon-to-be-4-year-old (will have his 4th birthday at this resort!) and the food. Can’t forget the food. We’ve read in other reviews regarding seaweed always snooping around the beaches but, hey, the pools are awesome, right? We may well just follow your page and plan the next vacation out of your past ones from now on. Thanks for stopping by, HJ! You’re going to have a great time. And so will your 4 year old. 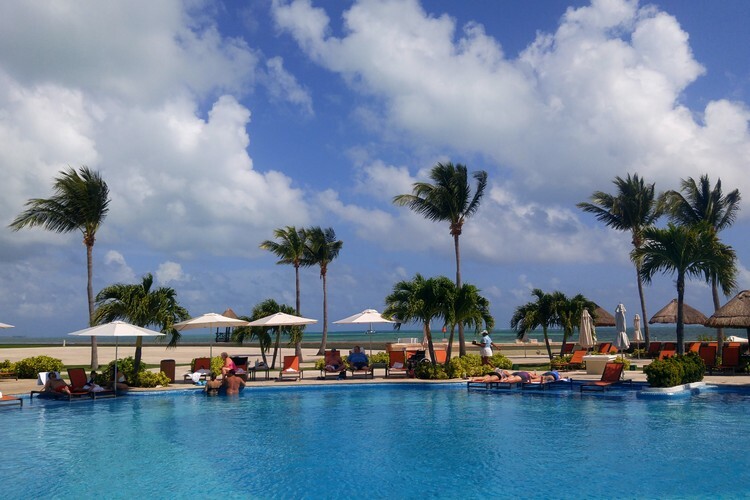 You won’t even have to leave the resort if you don’t want to – lots to do. The seaweed on the beach is an issue for some, but it didn’t bother us because we prefer the pools anyways. 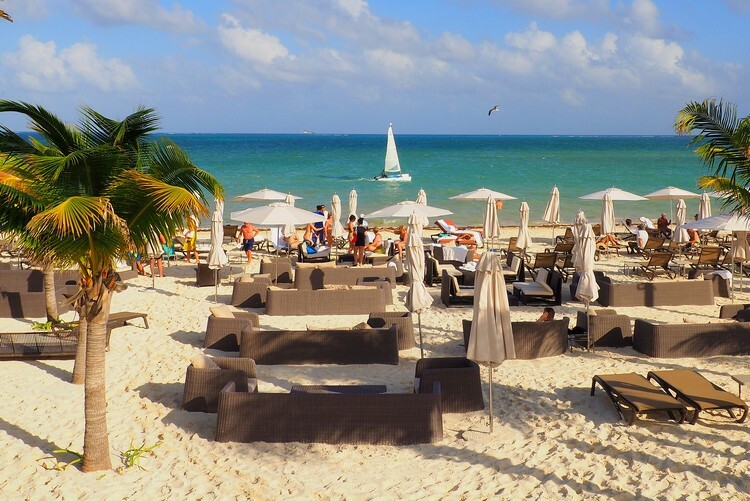 The sand where all of the lounger chairs are is amazing, so you’ll have plenty of time to sink your toes in the sand. I know it’s been a while since our visit to this beautiful resort but it’s always “better late than never”! 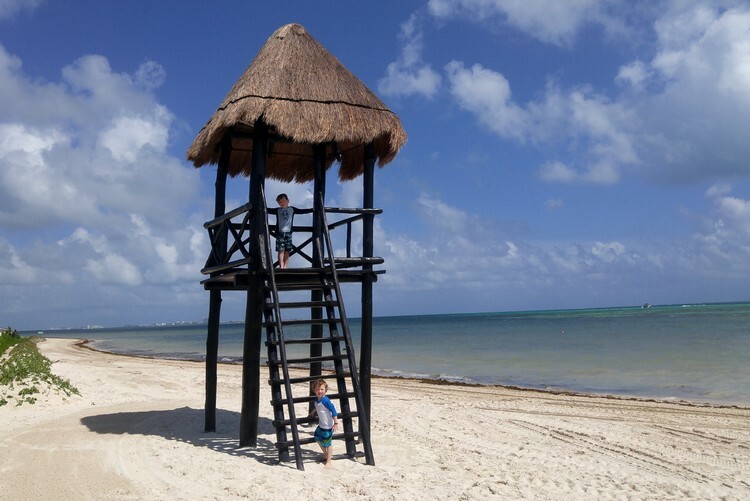 So… we visited Moon Palace back in mid-June and celebrated my son’s 4th birthday there. The resort was beautiful. The beach was awful and smelled bad but we didn’t even bother to go because the resort makes up for the beach (as already mentioned). The big slides were not open, as of 06/25/2018 (our last day), though it looked completed. I asked one of the workers there and they said something about safety. Guess the inspection wasn’t done, yet. 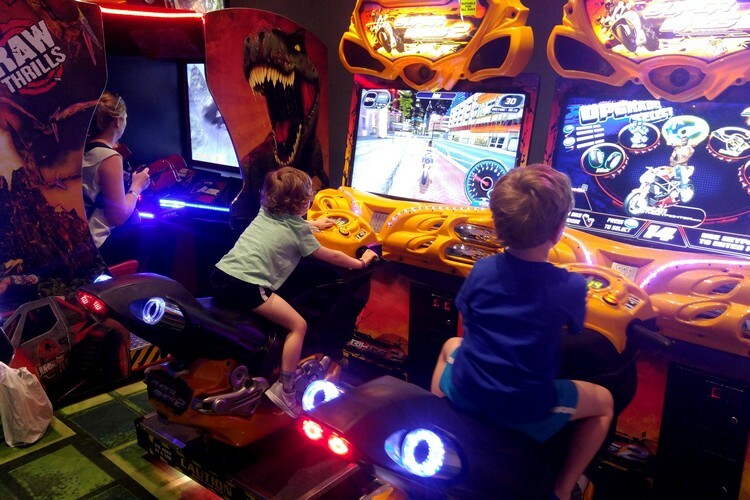 We met with my wife’s friend’s family there, so their 5-year old and my 4-year old played until they were exhausted every day. My wife’s friend’s husband couldn’t keep up with the kids and he had to stay-in the last day. Ha ha. We had a blast. 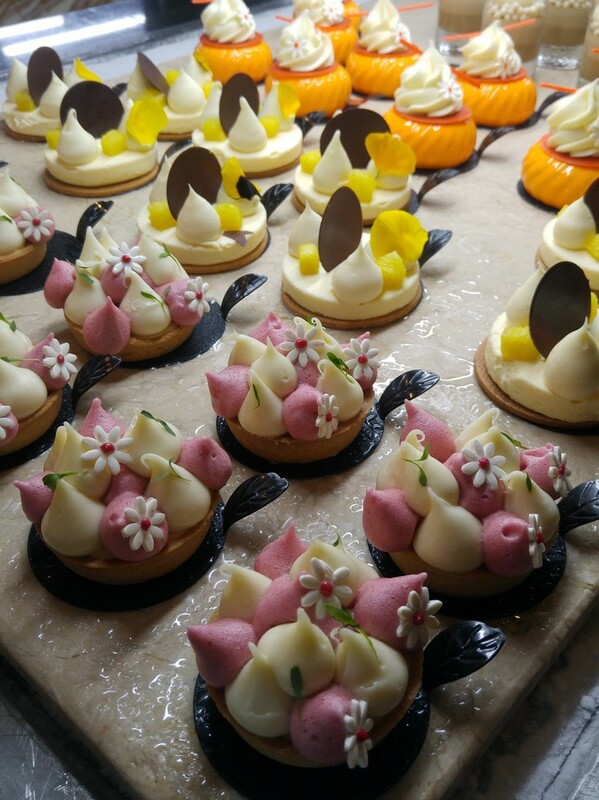 Foods were good, pastries were amazing. The snack bar was GREAT! I wish you guys great lives (and always be safe!) and we’ll make sure to visit you again soon. Thank you again for your great review and tips. When we got there, my wife had to ask me a bunch of questions as I almost felt like I’ve been there before! Your site is awesome and so helpful;. Thanks for taking the time to create it! I was wondering, what time do the pools generally close at the Grand? I have a swim up is it connected to a larger pool at all? Do you recall which swim up building is closest to the lobby? Did you swim with the dolphins on site? Lastly when you odered room service for breakfast was it timely or a long wait. Thanks so much leaving to go there 6/22 for a week. with our boys! From what we remember, we think the pools closed around 9-10pm. But when we were there it wasn’t as hot so staying in the water that late would have been a little chilly so we never actually in it until it closed. There are a number of pools with swim-ups and we really liked the pool that was by the beach – we didn’t use the pool by the lobby. And, no we didn’t swim with the dolphins. Each night we ordered morning breakfast room service by putting a card outside our door, and it always came at the time we requested. I hope this helps. You will enjoy your stay. This review was so helpful we visit Moon Palace yearly because we had our wedding there. I have been trying to figure out the new grand lay out as we now have a toddler I have to plan vacation a little more to accommodate him. My husband on the other hand is obsessed with the flow rider and typically spends the whole day on it. Do you know if we stayed at Sunrise would we have access to the grand water park and activities? Or is it now only if you stay at grand? Also are any of the pools at grand side heated? There use to be 2 pools that were heated before renovations began. Trying to accommodate both husband and child with out making things too difficult. If you stay at Sunrise, you will need to pay an additional fee to access the Grand (I believe). If you stay at the Grand, you have access to all 3 resorts. I don’t recall if the pools were heated. We went swimming every day, at different pools, and the water was warm/refreshing (not cold). Great review! Additional question about The Grande beach…..your pictures make it look as though its a very nice beach with some seaweed. Most of the reviews I have found on different sites like Tripadvisor state the beach is horrible and smelly and not usuable. Did you feel this way or was it just a minor inconvenience? Thank! We did not spend a lot of time at the beach. We prefer the pools anyways. We did spend a few evenings walking on the beach and it was fine. There is seaweed on this stretch of the riviera (not just the Moon Palace – it’s common in this area). To be honest, we didn’t notice. It was not an issue for us. BUT – we didn’t spend much time on the beach. The beach is a no go for us.. We don’t visit Mexico to see and smell a horrible beach. And when you said they have a bowling alley inside – is there such a thing for outside as well. This is such a great review. Glad to see you guys had a blast. Thanks for the thoroughness of this. Thank you Mitchel. Glad you found it useful! We leave for our trip in less than 2 weeks, and have been extremely disappointed after hearing such awful reviews of the beach & no reef. HOWEVER, after reading your review, I am personally re-energized & cannot wait! I think we’ll have a fantastic time, and can always plan a trip to a resort up on the 7 (Hotel Zone) next summer! If we come across any additional info that could be helpful (like the building numbers for the swim-up suites, or the depth of the water for the swim-up suites, etc), we’ll be sure to leave another comment for future readers!! Thanks for your comment, Cathy. I’m glad you found the post helpful. Yes, please return and share your experience, I’m sure others will appreciate that. Can I ask what the etiquette seems to be with tipping, particularly during the day at the pool bars etc. Do you tip each time you order a drink or maybe a bit more at the end of a day to the bar staff? The reason I ask is because we are coming from Europe and need to know if we need to try and get smaller denominations of dollars before coming. We struggled with the tipping etiquette as well. We tipped at the a la carte restaurants. We also tipped at the pool. We had to find small bills often and the front desk was not able to help. It was a little frustrating. So – YES – bring as many small bills as you can find. At least $200 in $1 or $5 bills. Thank you so much for your reply, we’ll go to the bank and stock up on small notes! So we’re planning on going in September. My husband and I went there for our honeymoon (I think we stayed at Nizuc). But this time we’re bringing the kids. What is your opinion on the Grand vs the other Moon Resorts? Do you think the Grand is worth the extra money? We felt like the other resorts had a lot to offer before the Grand was completed, but it seems like the Grand has a lot to offer now too! We love staying at The Grand because we had access to everything. 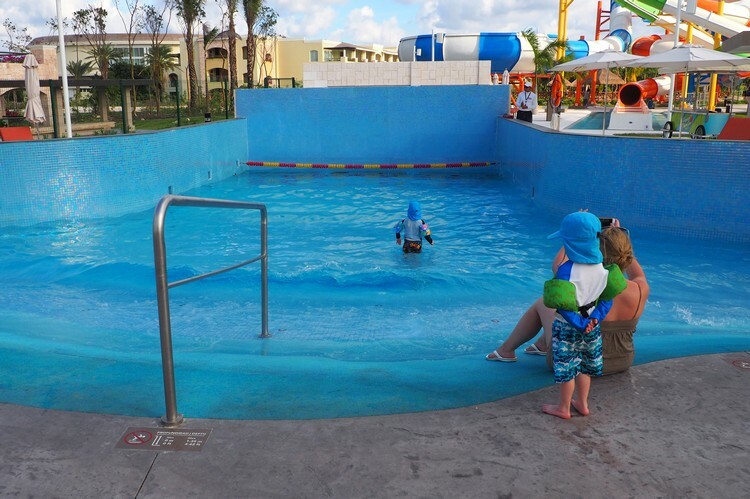 We did visit a few of the other pools and checked out the kids clubs, and truthfully thought The Grand was outstanding. It did offer more so we feel the difference in price is worth it. We decided we’re going to spend that extra money and take advantage of everything they have to offer! No, we didn’t find the size to be overwhelming. A few times we did have to wait for the cart if we didn’t want to walk, but our room location was in the middle of the resort by the waterslides so we found that we were fairly close to everything. I don’t ever recall them asking for proof of Connor’s age (he was 4). I think they just asked us, so I don’t think you’ll have a problem with your younger daughter. We hope you have fun! We would love to return. Thank you for this review. We are going in January 2019, have been going since 2001. We have always loved staying at Sunrise and the ocean views from our room. Do you know if there are any ocean view rooms at the Grand? Maybe presidential suites? 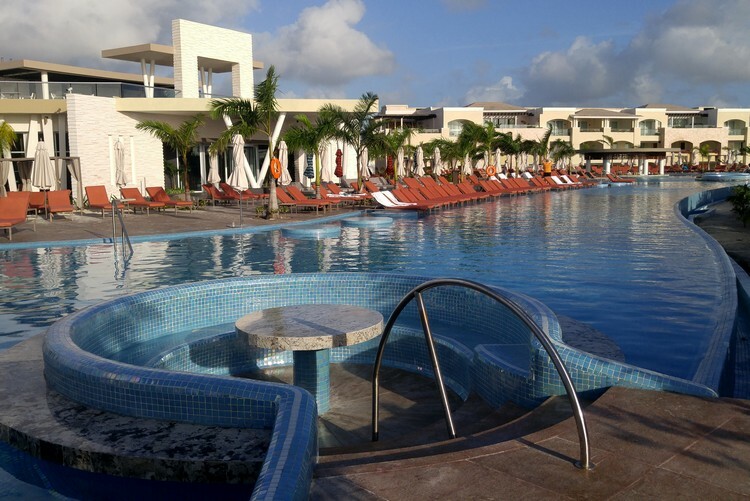 We also have always enjoyed the pool and swing bar at Sunrise…..do you think we will enjoy the grand pools as much? 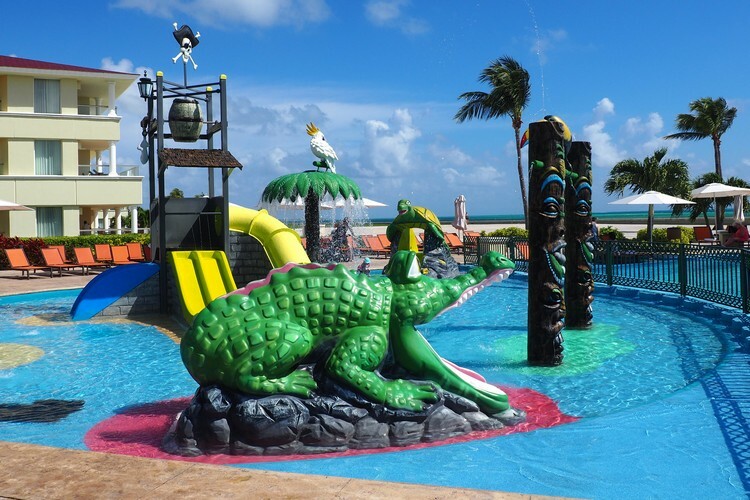 We are traveling with my daughter and her family, they have a toddler….the kids pool at sunrise is very cute, do they have similar at the grande. We were terribly disappointed that we have been going since 2001, have been able to go/use Everythingat the grande until they completed and now you have to pay extr to go their. What to do???? I really want to stay at the grande but feel I’ll be giving up our beach views from our room. Thoughts. Thanks again. For your review it was fantastic!!! Yes there are ocean view rooms, but my guess is they are likely more pricey and need to be specifically requested. So, I would contact The Grand to ask. 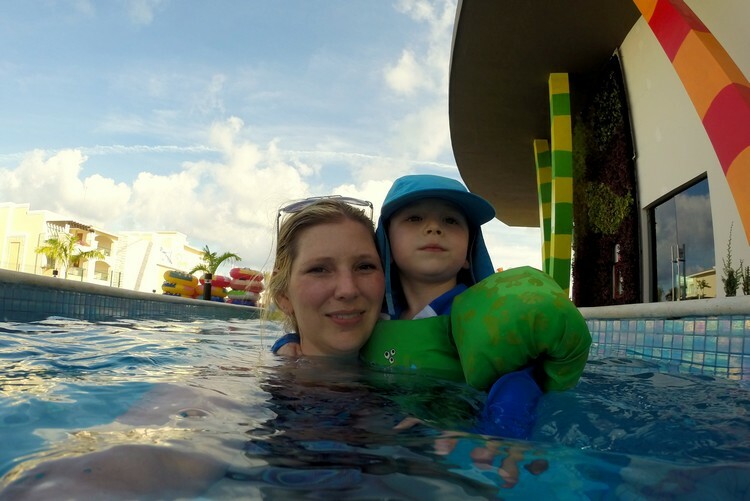 We really loved the pools at the grand – there are so many to chose and each had a different vibe. We really liked the one by Cuzco restaurant closer to the ocean. We did visit the kids pool at sunrise and it was fun. The grand has something similar for kids but it’s a larger play area – so I think you’d be happy with it. There are pictures of it above (it has small waterslides). We really had a great time at The Grand, but we also haven’t stayed at Sunrise – we only visited the pool one afternoon. 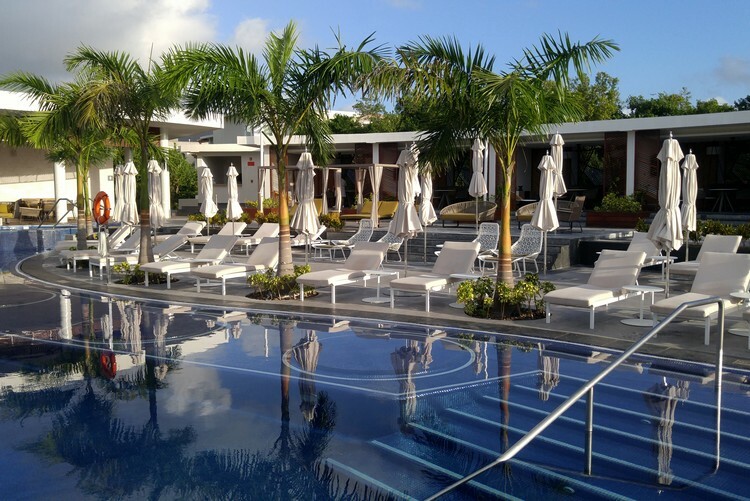 One thing to note is the pool at sunrise was way more busy – from our experience. Awesome review!! Thanks for taking the time!! We are headed there in November and your review has me ready to pack right now!! Thanks again! Thanks for stopping by Karin. Just wondering if you did any upgrades? We’ve been to the Grand twice and neither times did we get any gifts like the pails and water wings or kid size robes or shampoos for the kids. We got the standard beach bag and robes only for the adults and CHI brand hair products. 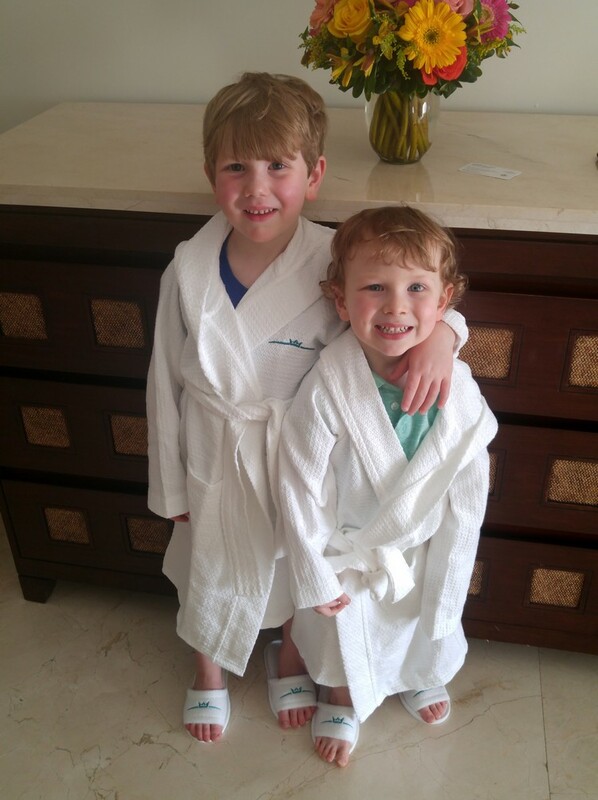 We are heading back there again in the new year, I know my 5 yr old daughter would definitely love having a robe to wear in the hotel room. No, we didn’t have an upgrade. I would maybe ask them ahead of time, or check at the front desk and ask. Hi. Great job reviewing the resort. We’re going there in January. My best friend and our spouses and 4 children. Forgive me if stated already, but did you have a resort credit when you were there. If so how was your experience with this. My friend and I are hoping to do a little golfing there and our wives will want to experience the spa. If memory serves me correct we get 1500 per family for our trip. Did you find the credit useful? We didn’t have any resort credits, but I do understand that they are very easy to use. We talked to a number of people who used credits at the spa. They said it’s amazing and we’ll worth it. Enjoy! You’re going to have a great time. Great review so useful, especially the part about allergies! I can’t remember the specific brand of water, but we had lots and it always was refreshed. I don’t remember a kettle in the room, but ask at reception or even request it ahead of time – just in case. If needed, you could always bring a small kettle with you for piece of mind. Have a great time! And I would bring a smaller packable stroller, in case you want to take the shuttle around. It will be easier to get in an out with a foldable stroller. The brand of the water bottle is “Epura”. Thanks for giving an in depth review of the resort. Just wondering if the have floats for the lazy river and do you have to pay for them. Thanks for the great post. We are 99% sure we are going to stay at the Grand this March. Just looking at all your pictures of the amazing food. Is all of it included? Even the fancy gelato bar? 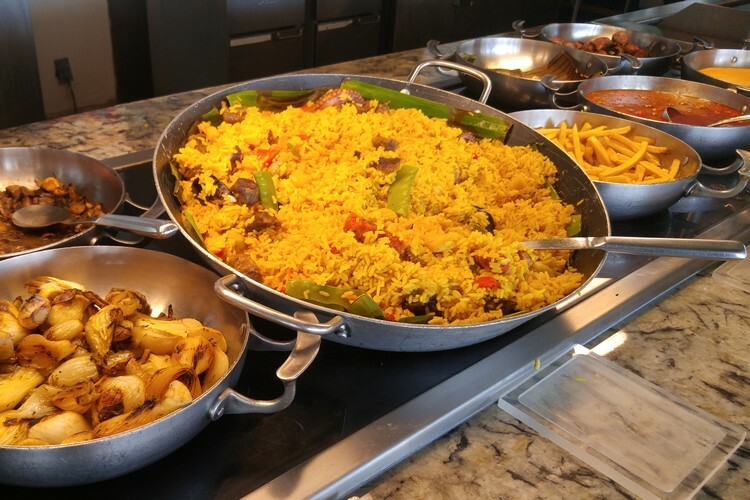 Do we need to pay for any food or special beverages in the resort? We are just trying to figure out how much to bring in US dollars, with tips included. Did you tip the room attendants? Aside from tips, did your family spend in addition at the resort? 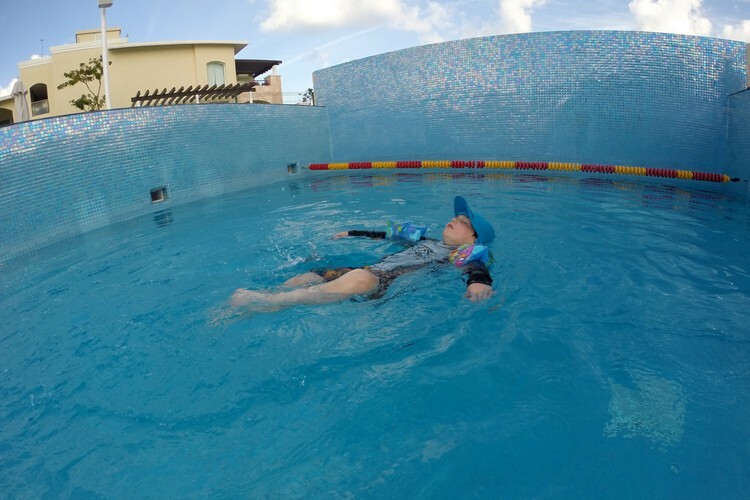 Are tween kids safe to walk from the pool to the gaming area on their own? Are there any shops on the property, my kids love to bring trinkets back.. Or anything close by? It looks like our flight out on the last day does not leave until 5pm. I assume checkout is mid morning. Can you recommend some idea of what a family can do in the area until 5pm? Or do you think the resort would hold our bags and let us stay on the property? It is so great and helpful article. Looks like you have 2 pictures view from 3rd floor room. 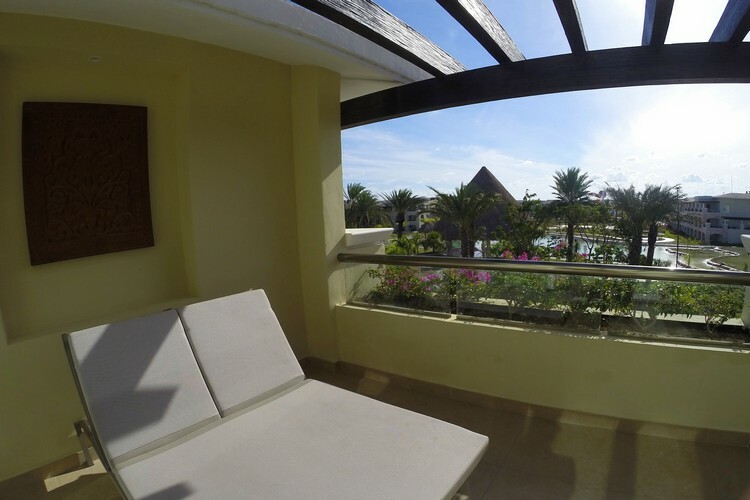 What view is better, to garden or resort? Hi. Thanks for your review. I am planning a trip there with my family for Christmas 2019. Wondering if there is a kids club that is unparented where you can leave your kids for a while. Also, do you have any info on how you get the diamond access? Is this the only higher priveldge club? Do you know what is included with that? Hi. Thanks for your review. I am planning a trip there with my family for Christmas 2019. Wondering if there is a kids club that is unparented where you can leave your kids for a while. Also, how is that managed? Do you get a pager or phone or something incase they want their parents? Do you have any info on how you get the diamond access? Is this the only higher priveldge club? Do you know what is included with that? For Diamond access I believe you need to be a member, or book through a member but were not entirely sure how it works. I would suggest you speak to Palace Resorts about Diamond Status. There is a kids area that’s unparented for older kids. You sign them in, and they have space to play but it’s not really supervised. This area is out by the pools. For teens, there’s also the wired lounge which is by the main lobby. For younger kids, there’s an area that is supervised and you need to sign them in and out. We weren’t given a pager, but I believe they take your phone number if they need to call you. Okay I’m a tad confused here. I stayed at Moon Palace Golf & Spa around 10-12 years ago, in fact it could have been longer. Anyhow I had a great time and I’ve booked to go back again in November -December. Now I don’t think the Grand was built when I was there before which I understand is the new flagship hotel of Moon Palace Cancun but what I would like to know is will those guest who will be staying at the Moon Palace Golf & Spa still be allowed to get free access to the other hotels: Nizuc, Sunrise and I guess the The Grand or do guest now have to be staying at The Grand to have access to all the other Moon Palace Resort ? Or has Moon Palace Golf & Spa been renamed The Grand ? 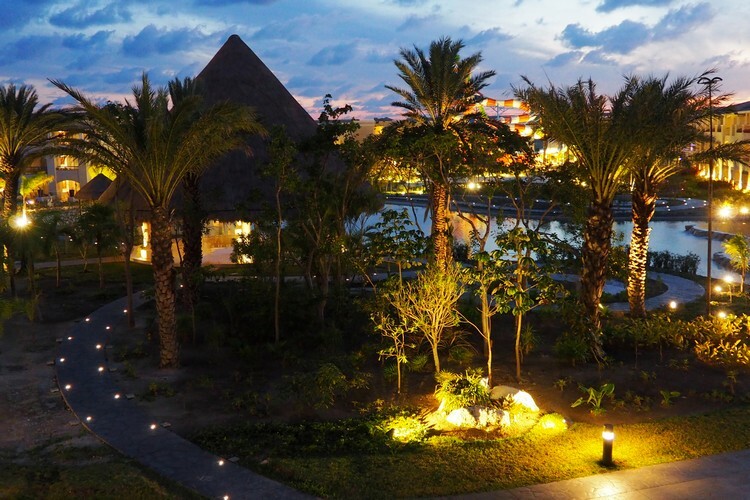 The Moon Palace consists of three resorts (sections): Sunrise, Nizuc, and the Grand. If you stay at the Grand, you have access to all three resorts. 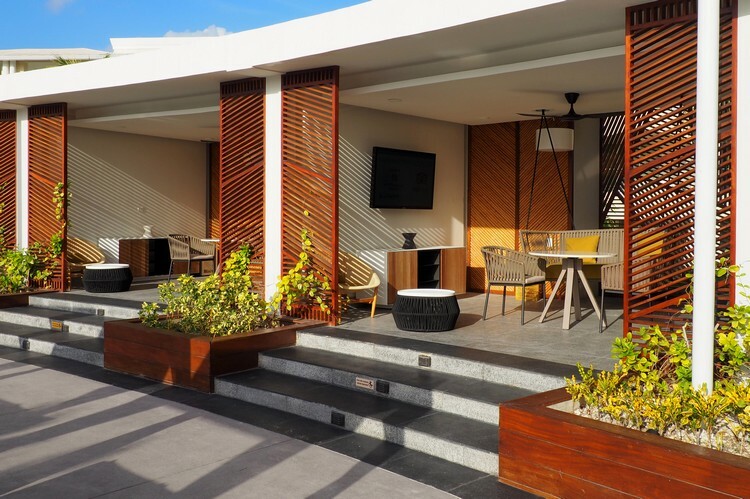 If you stay at either Sunrise or Nizuc, you can visit all the restaurants in both buildings including the spa and restaurants by the Golf course. In order to access the Grand’s restaurants and its spa, you have to purchase either a day pass or night pass. Thanks Nguyen! Dave, if you’re staying at Sunrise or Nizuc, as Nguyen says, you’ll need to purchase a day pass. Sunrise and Nizuc are fabulous too! You’ll have a great time! Hello! First of all, thank you SO much for this review. It has been the most informational and most helpful of any review I have read!! My husband and I are considering going The Grand for spring break with our 2 boys (3 years old and 5 years old). Do you know/recall if you can leave the kids at the kids club? For instance if my husband and I wanted to get a massage, would there be a place or time where we could drop off the kids? Is there an extra charge? Thank you!! I’m glad that you’ve found the review helpful. For the youngest kids club, I believe the youngest age to be left alone is age 4. So you’ll be able to leave your 5 year old, but not your 3 year old. 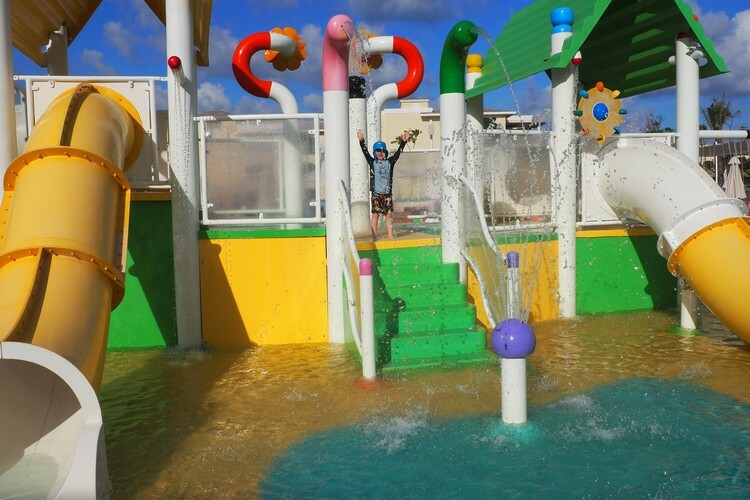 There’s no charge to leave your kids who are 4 and above at the kids club. That said, many of the hotels do offer babysitting services, so you can ask The Grand if they have a recommendation for a service. Great review! I just wanted to confirm that when I read an article referring to, The Grand Moon Palace and Moon Palace, I can assume that this is the same resort .. ? Might sound stupid but I cant seem to figure it out. Hi Martin – they are separate resorts, but located side by side. Thank You for the great pictures! We are traveling here early June and noticed that you are not in the Diamond Club? At what time did you usually eat dinner for the non reservation restaurants and how long did you have to wait for? Can you share the more popular ones? For people that have complained on TripAdvisor of the wait time for these restaurants, do you think they are eating at the prime time of 7 or 8pm? When the Diamond Elites eat? I did not see any pictures for JC Steakhouse in your review. Were you not able to get reservations? That was another complaint on TripAdvisor by non Diamond Elites. Thanks! Thanks for your AWESOME review ! We will be going to the Grand Moon Palace 4/16-24, ’19. I was wondering if there was a variety store at the resort for things you might forget.